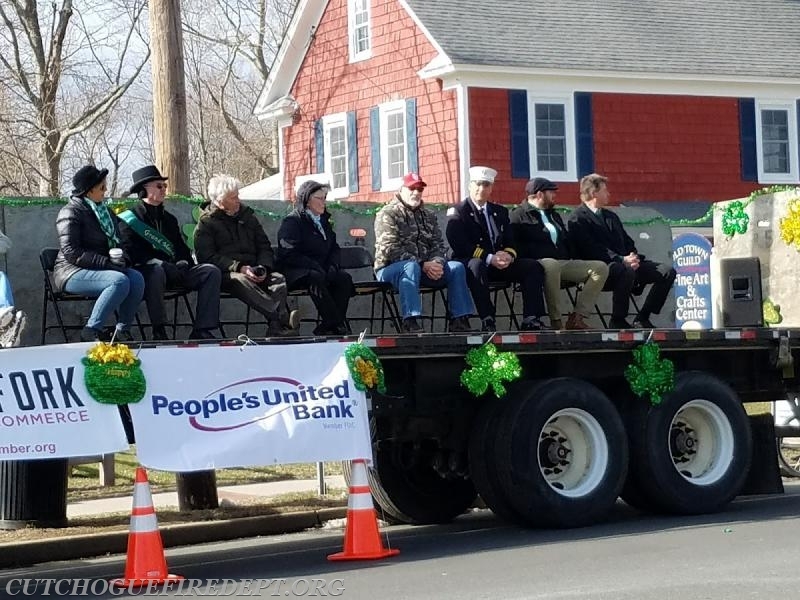 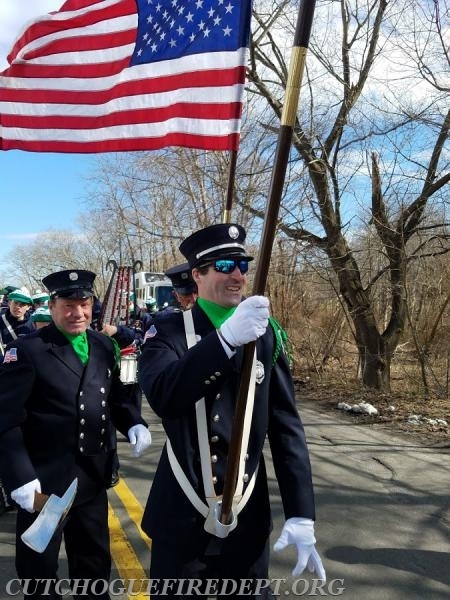 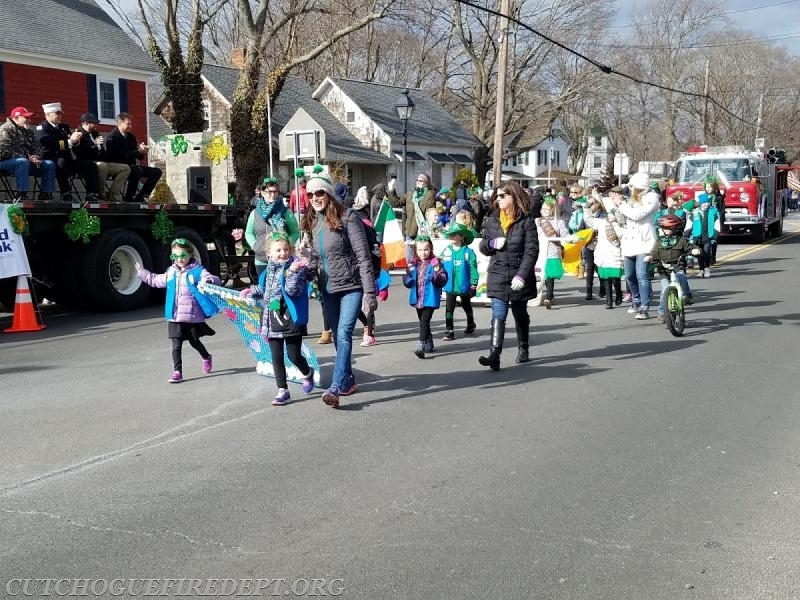 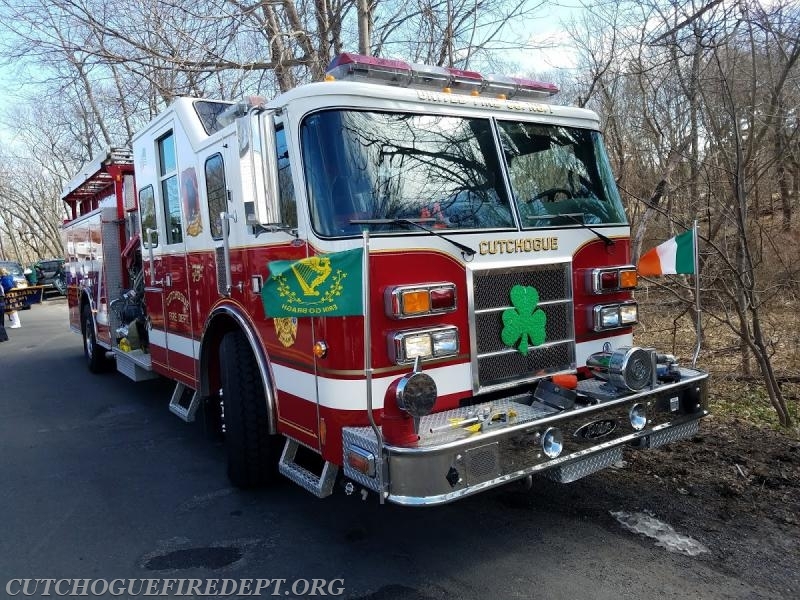 On Saturday March 10th everything in Cutchogue became a little greener once again as the Cutchogue Community celebrated St. Patrick's Day. 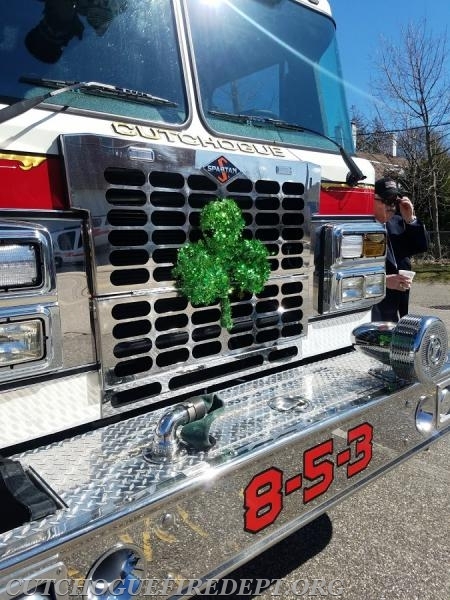 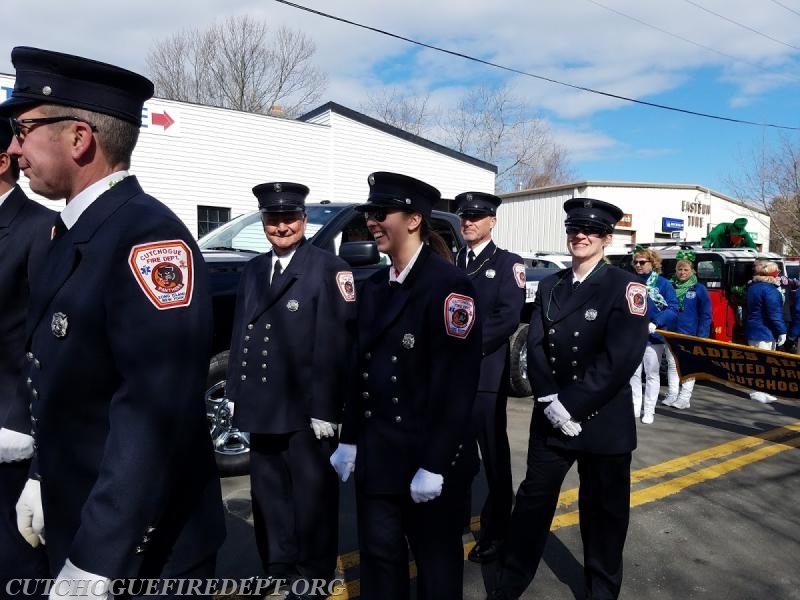 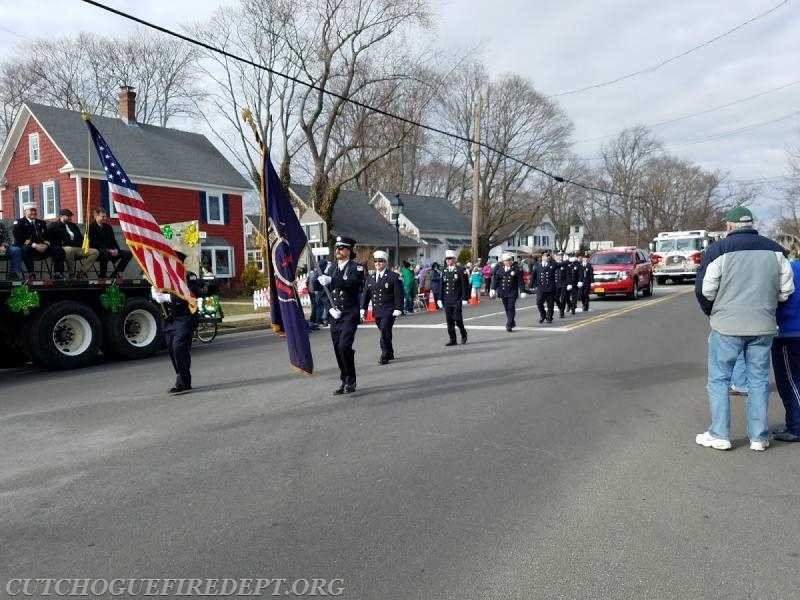 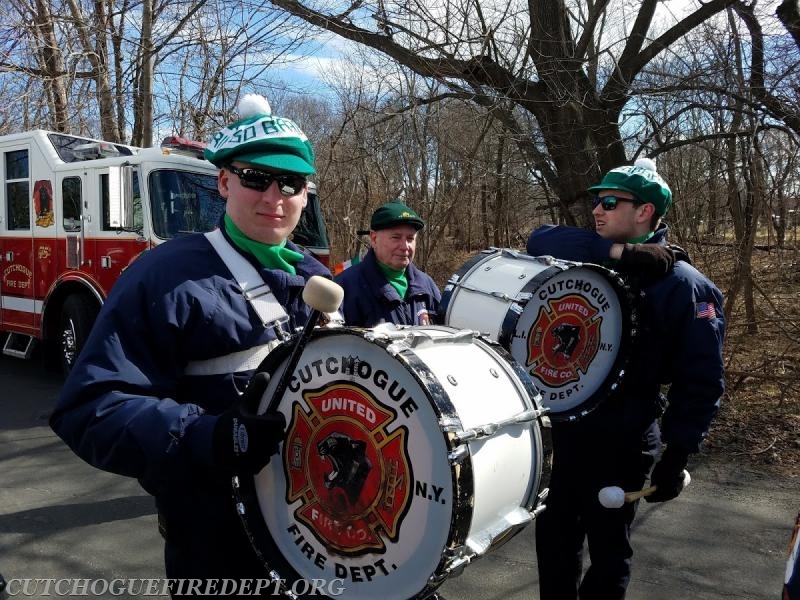 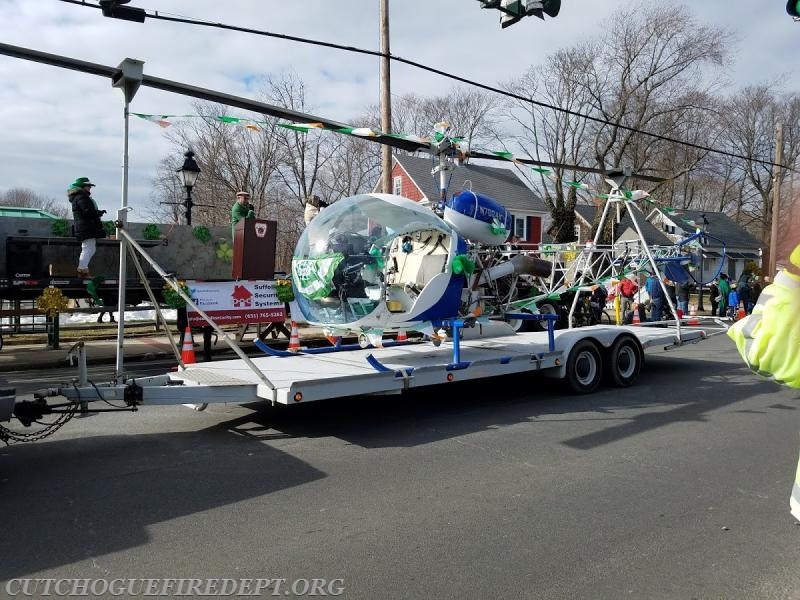 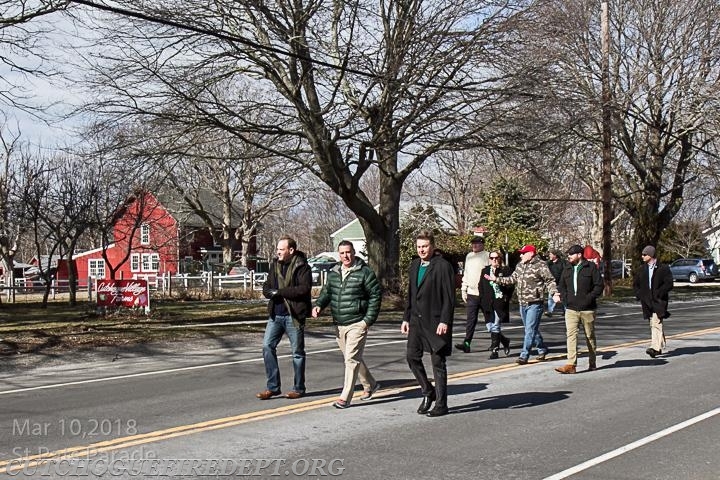 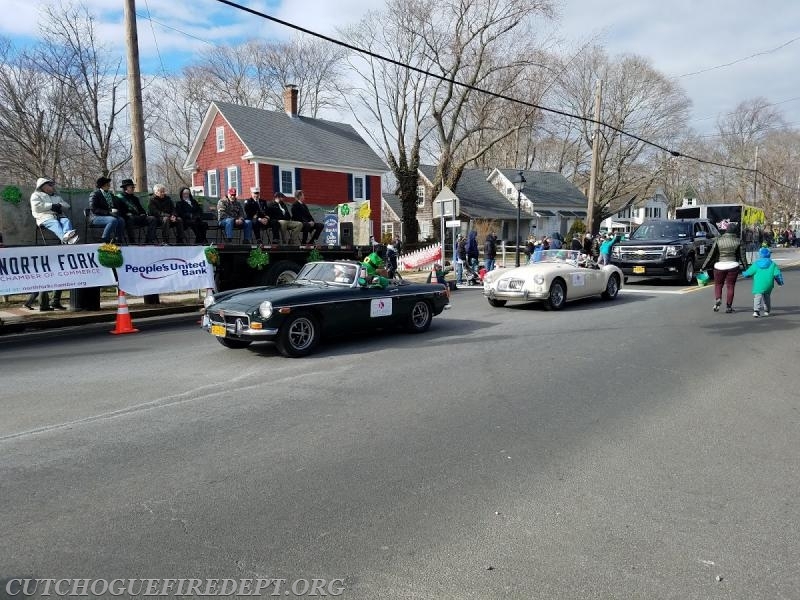 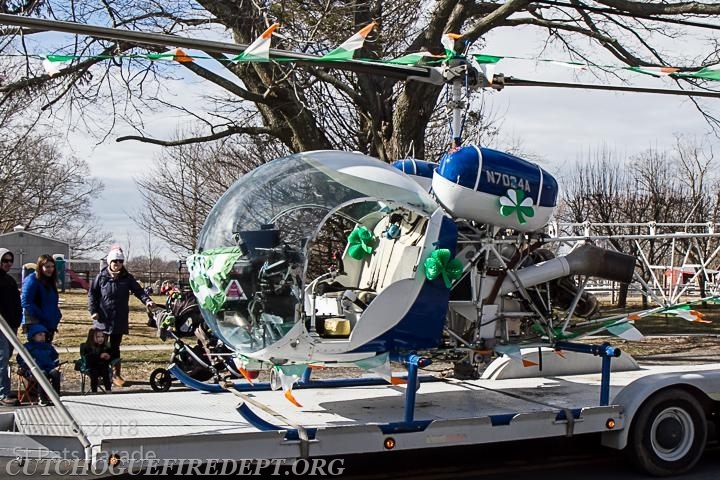 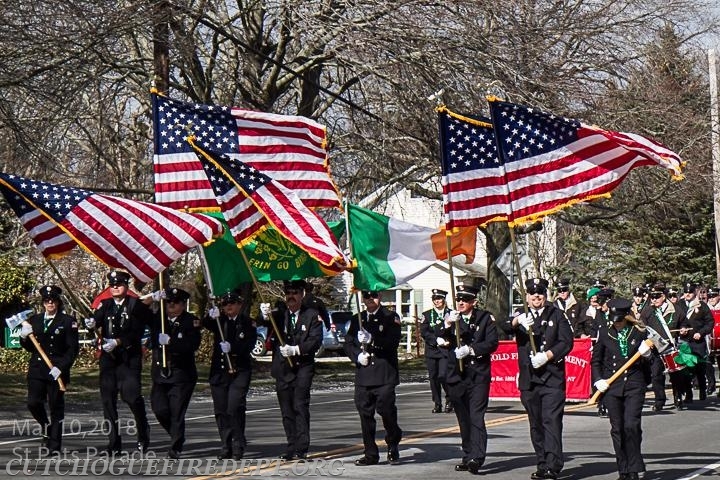 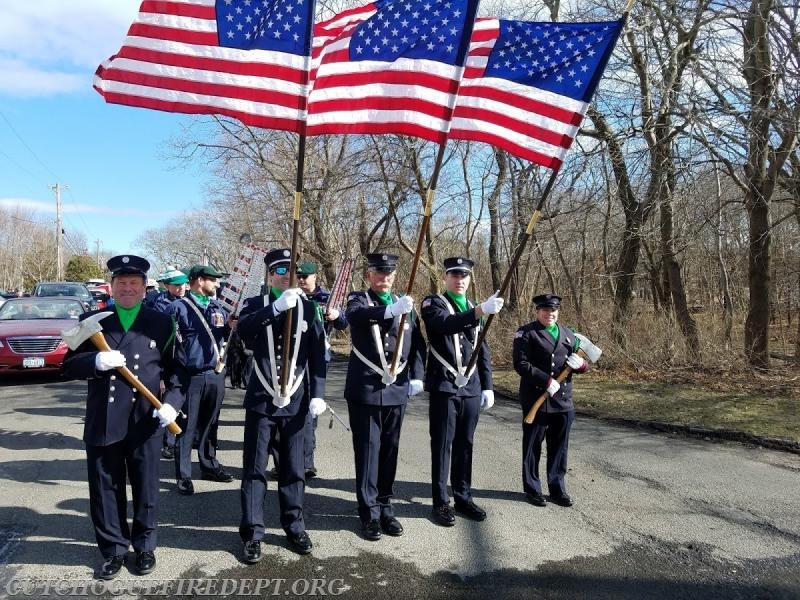 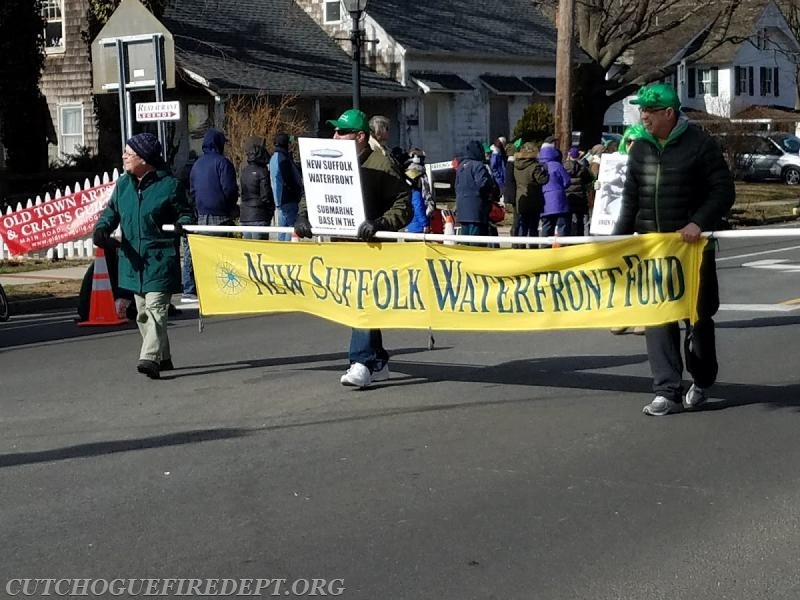 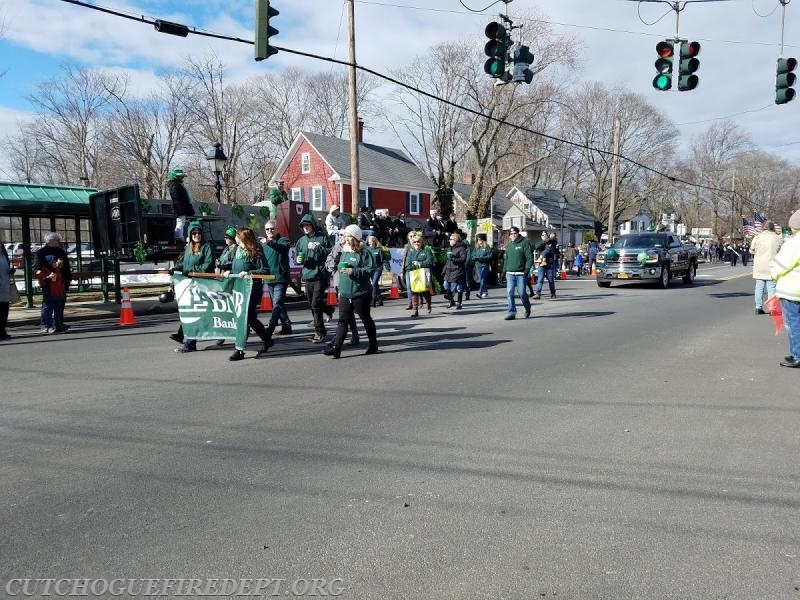 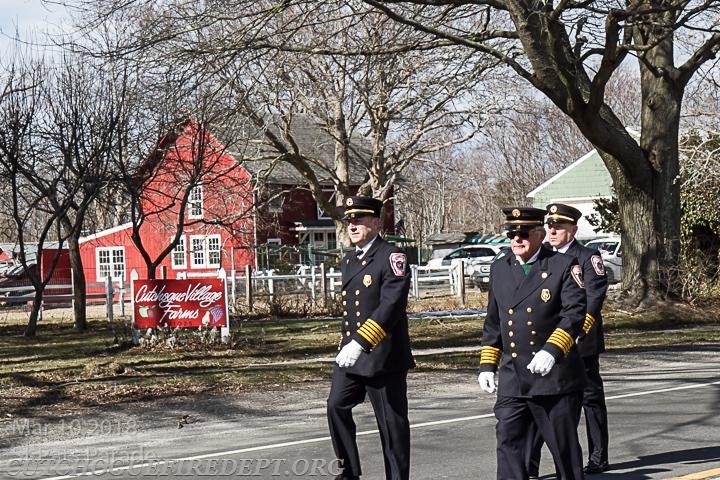 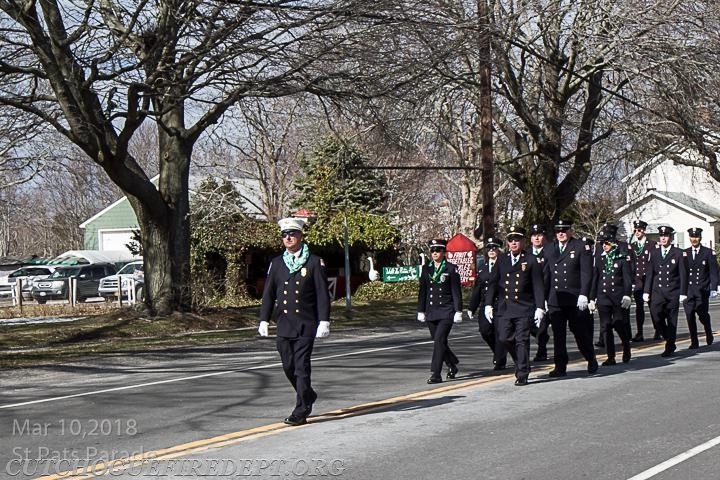 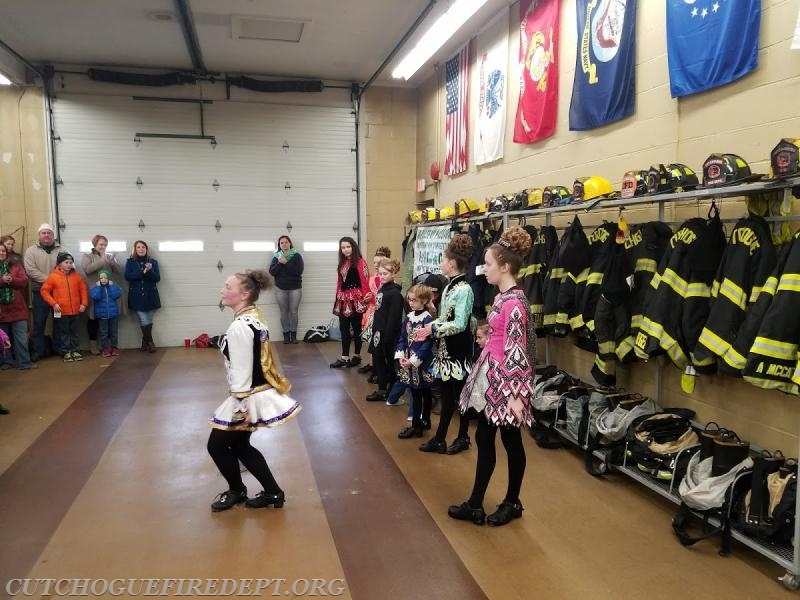 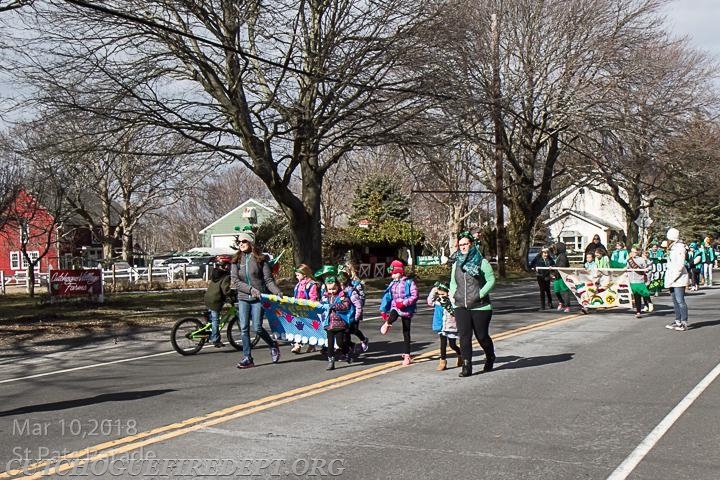 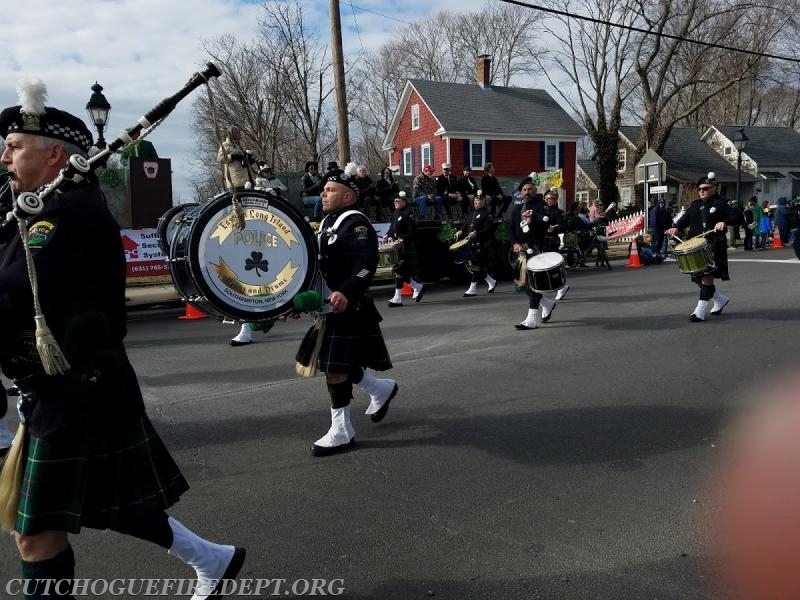 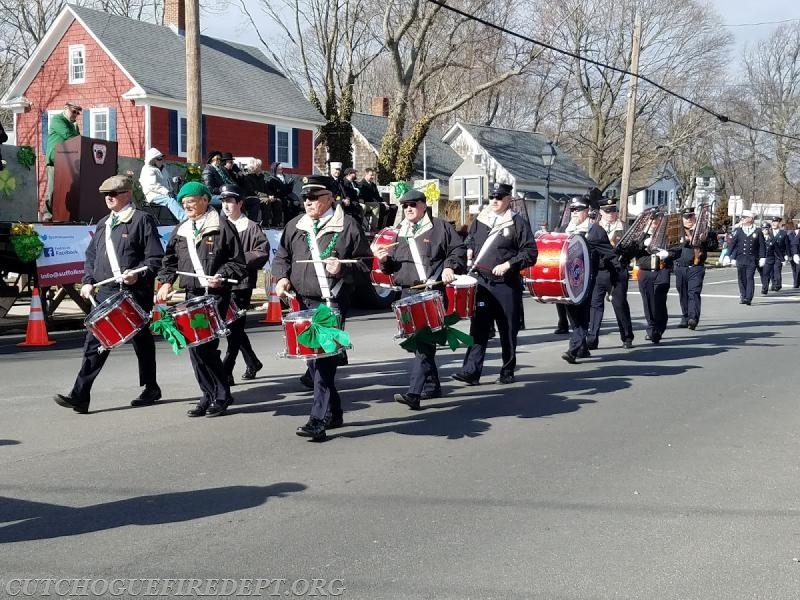 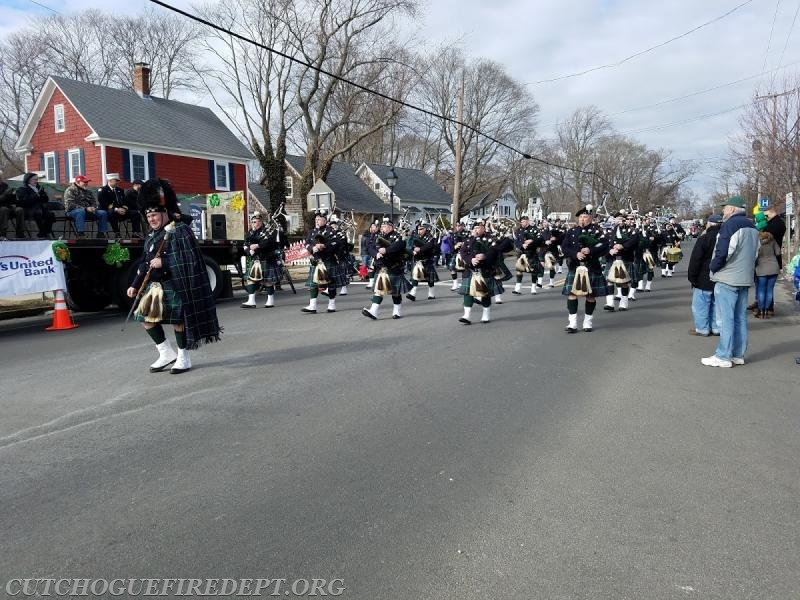 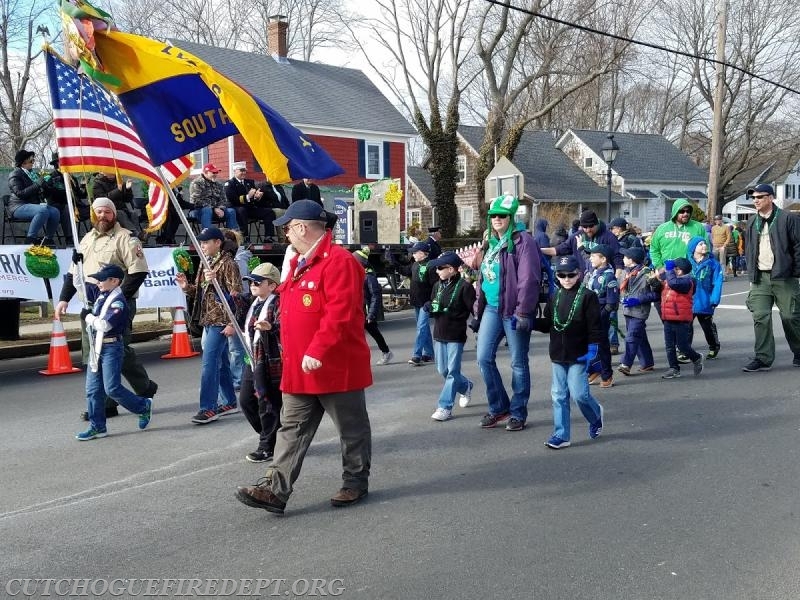 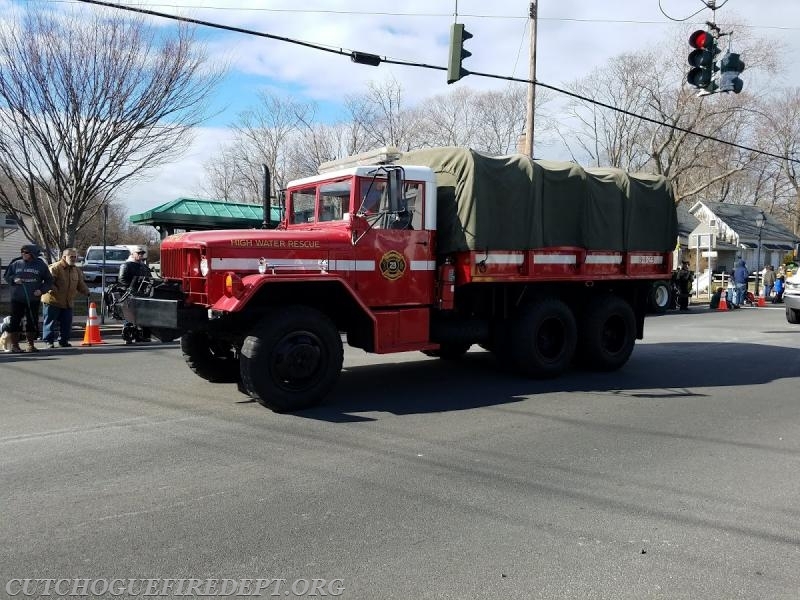 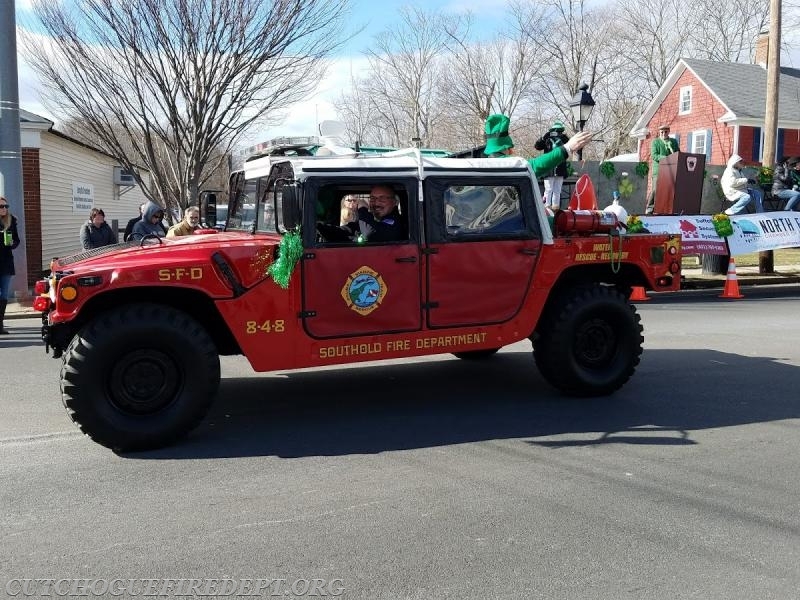 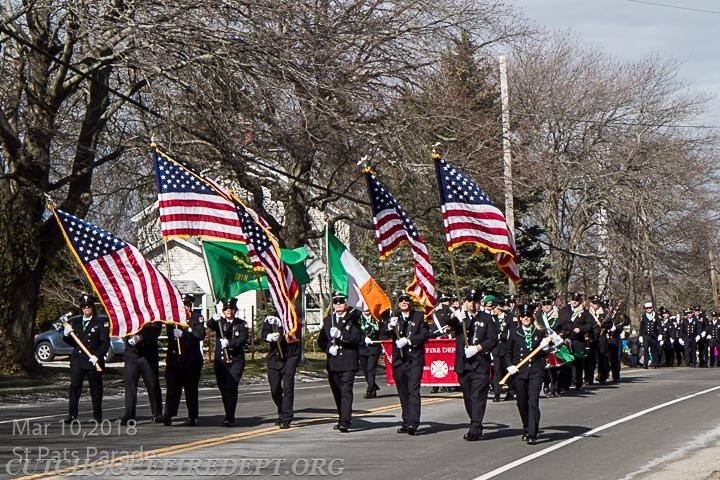 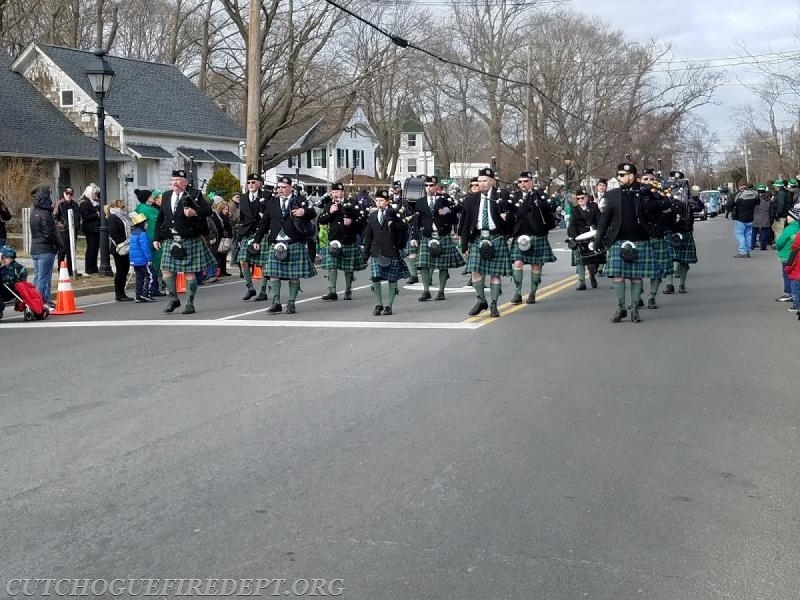 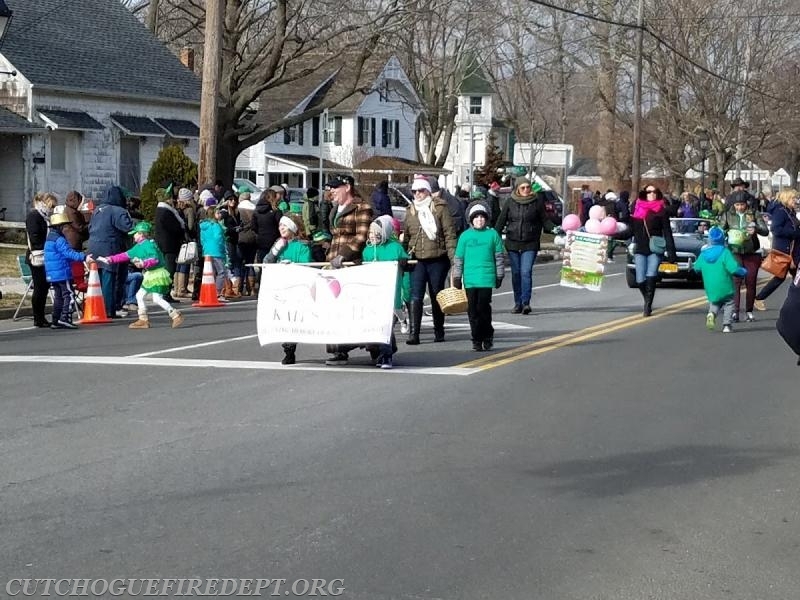 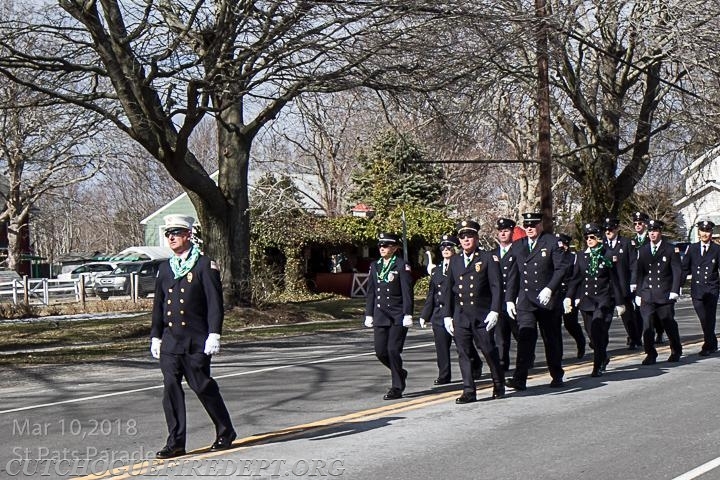 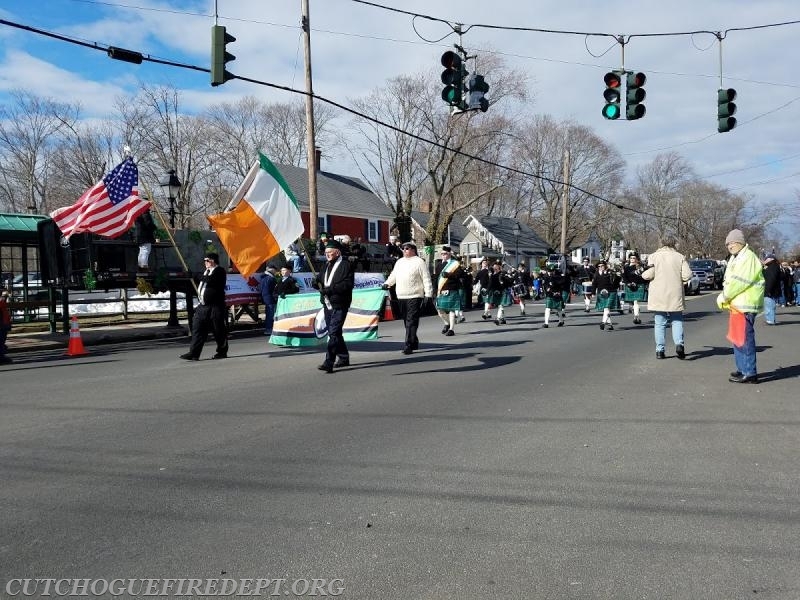 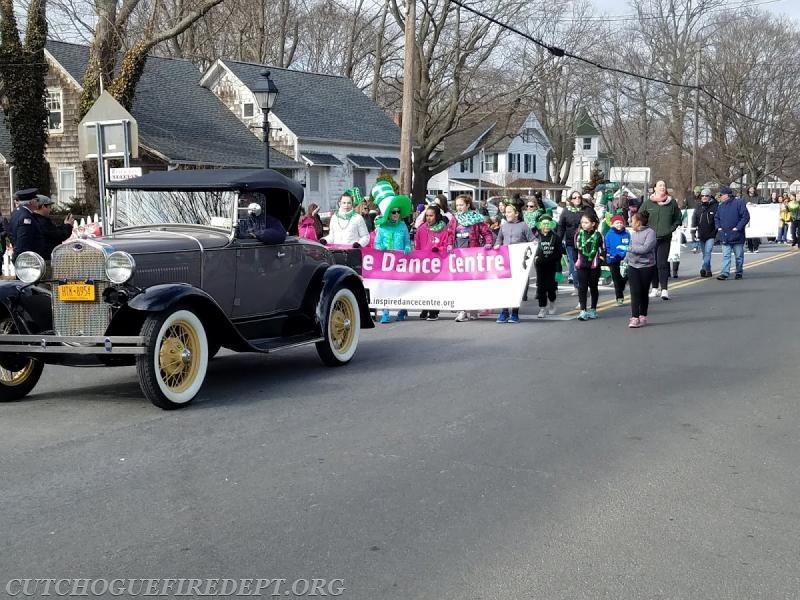 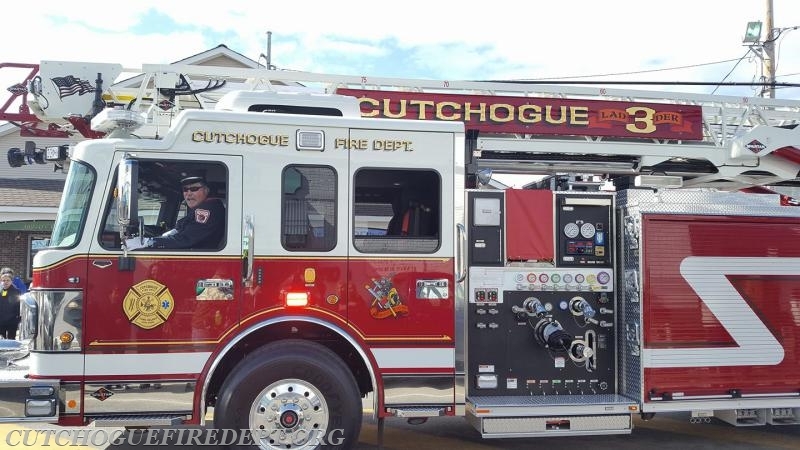 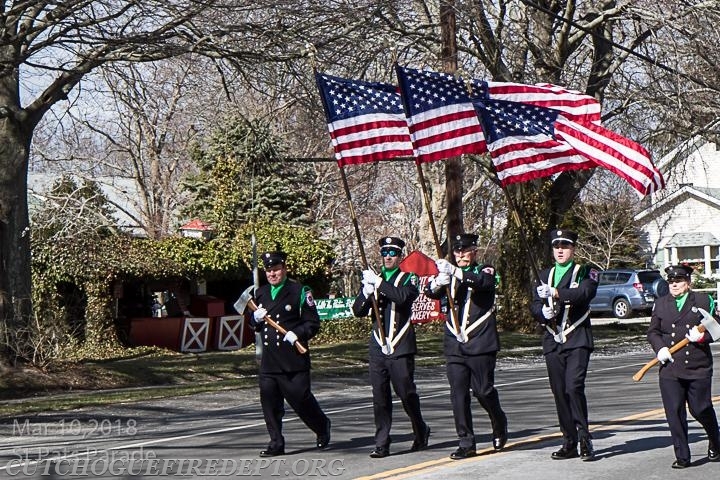 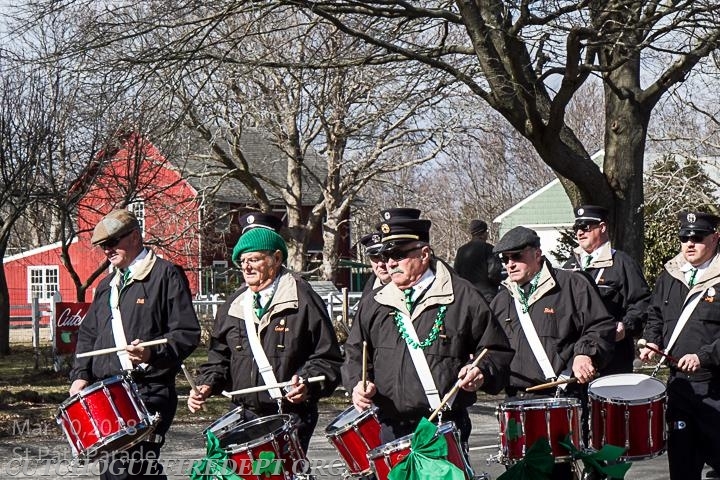 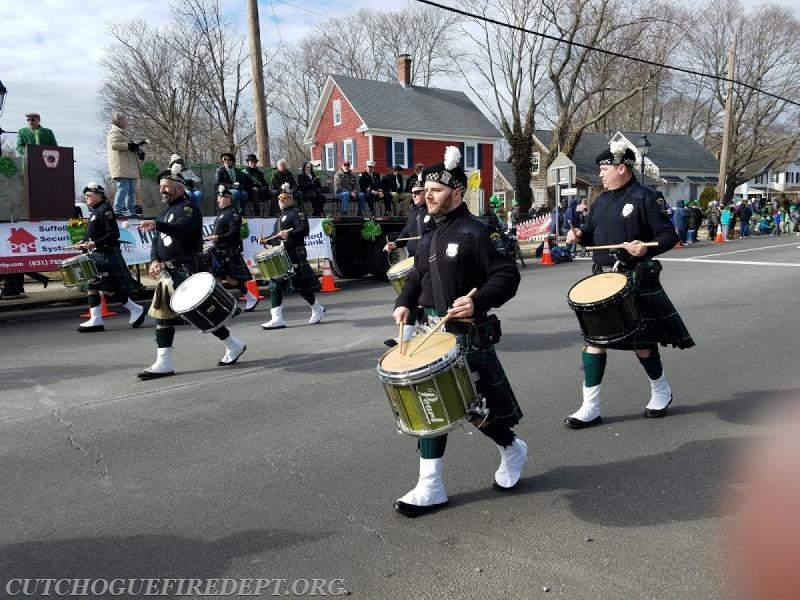 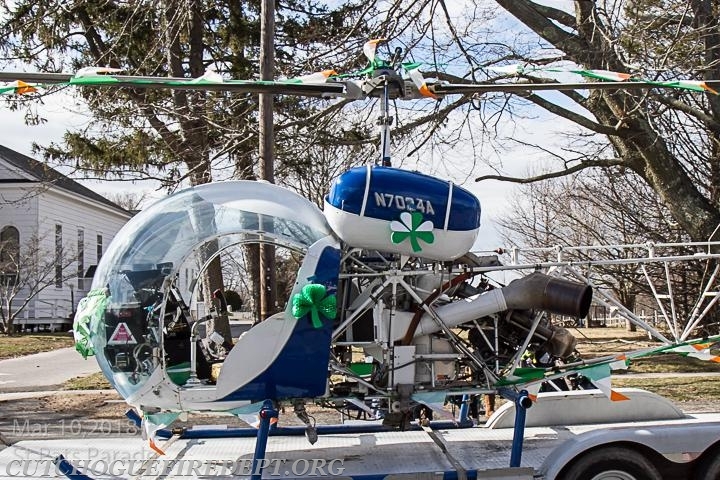 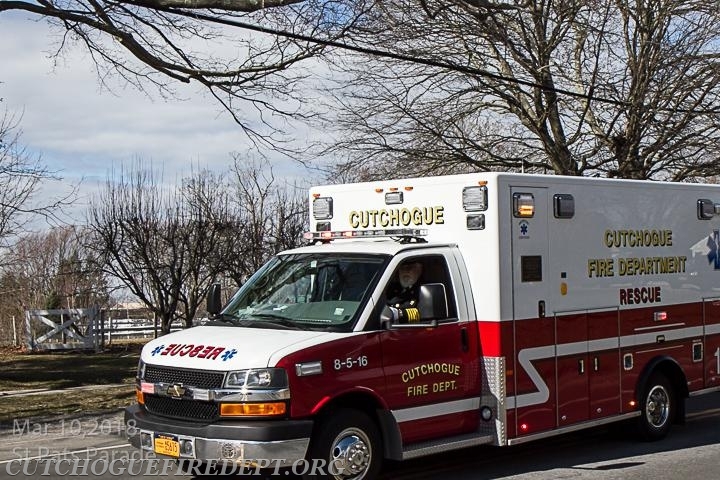 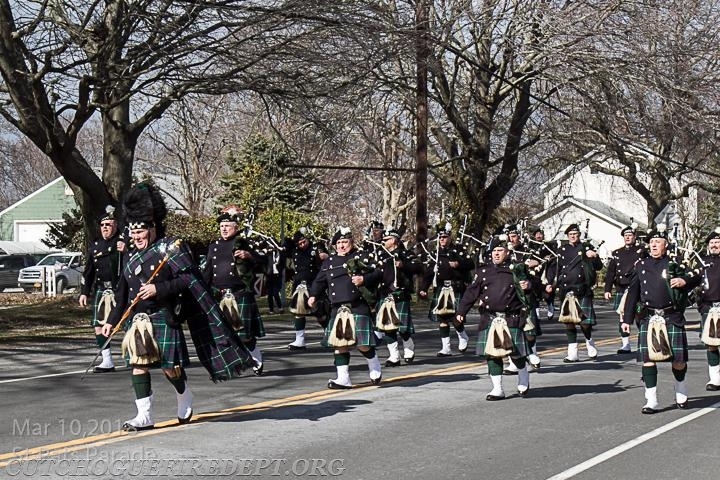 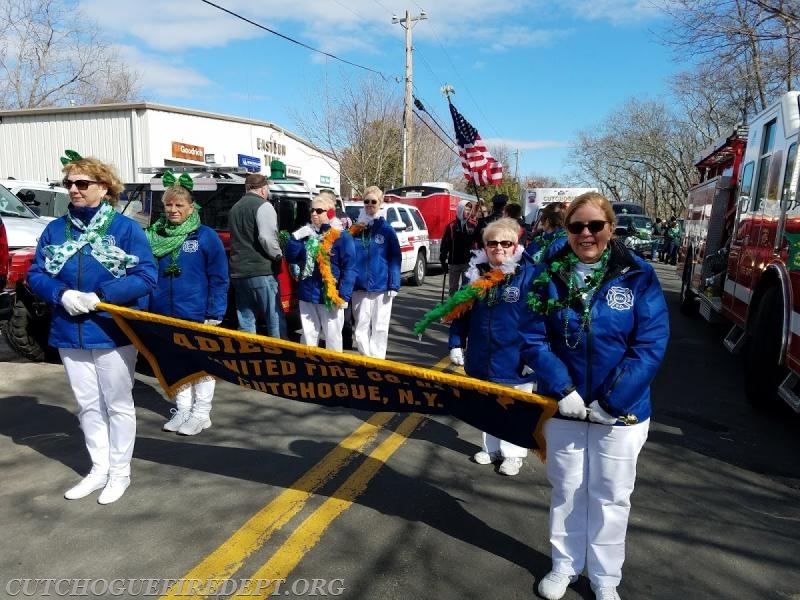 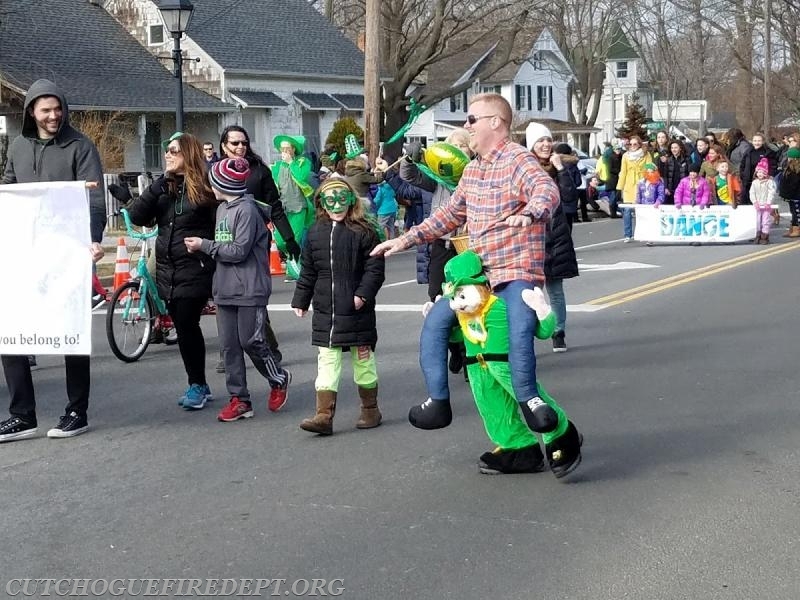 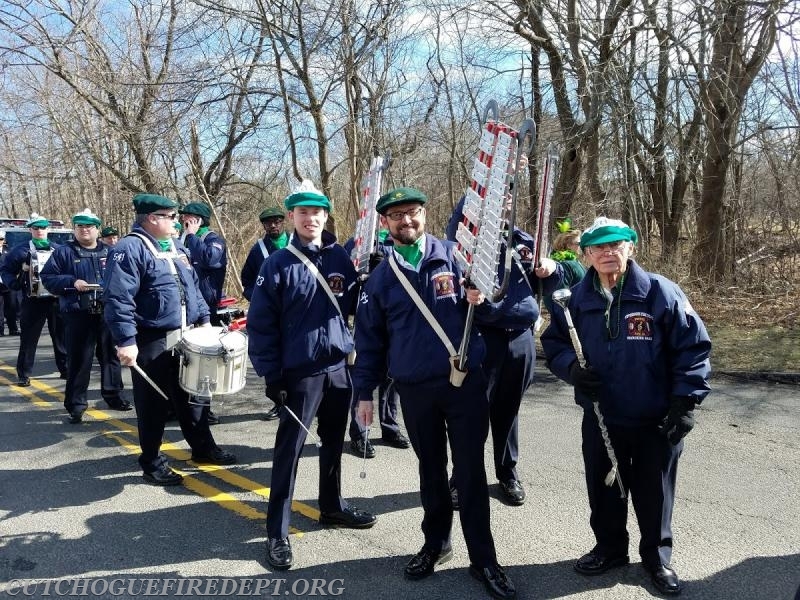 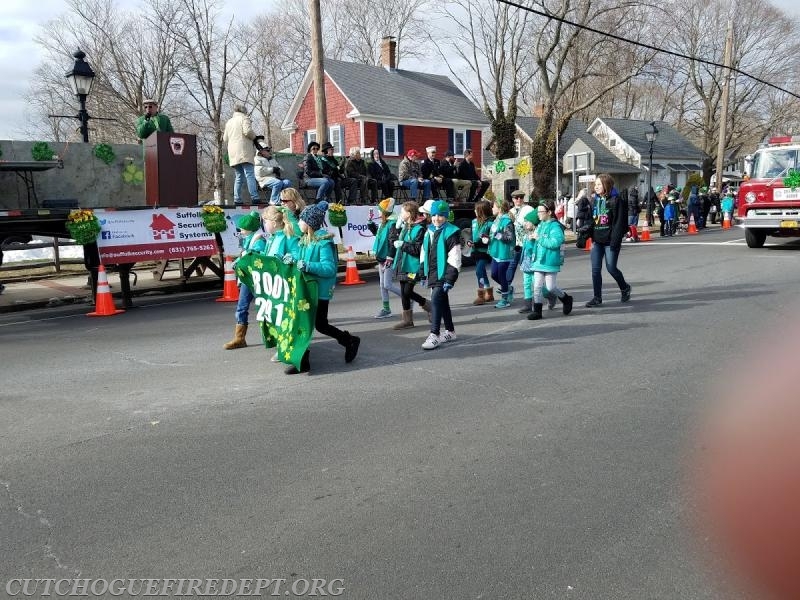 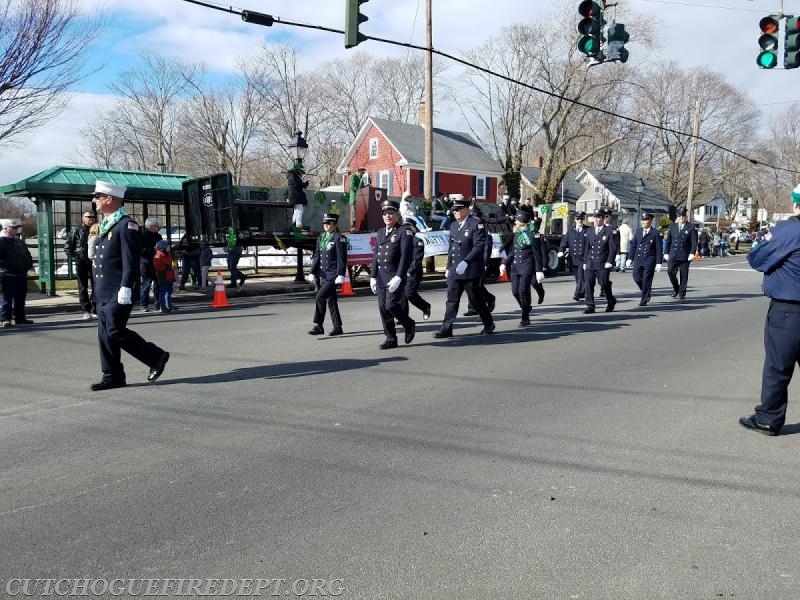 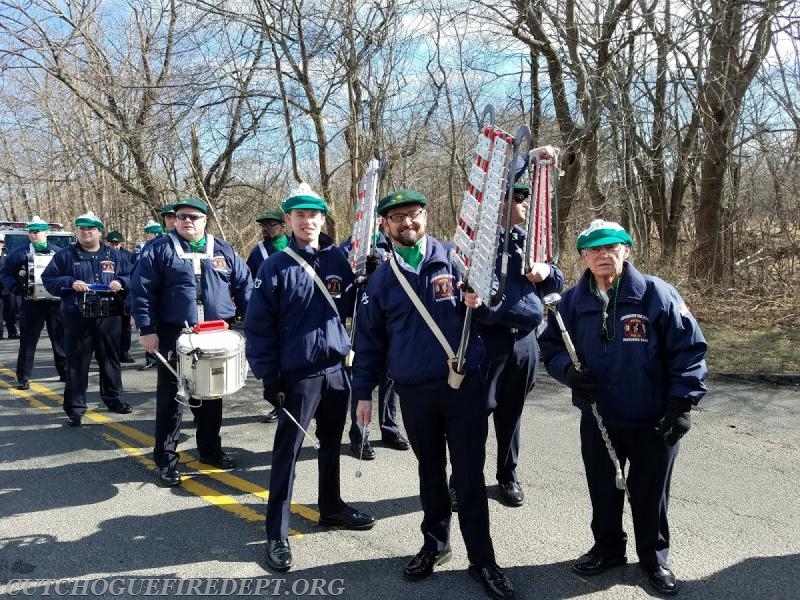 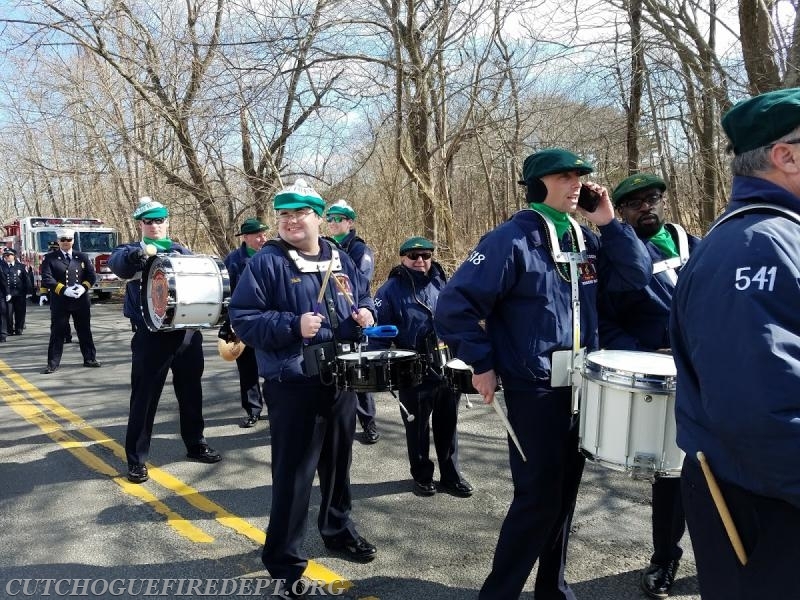 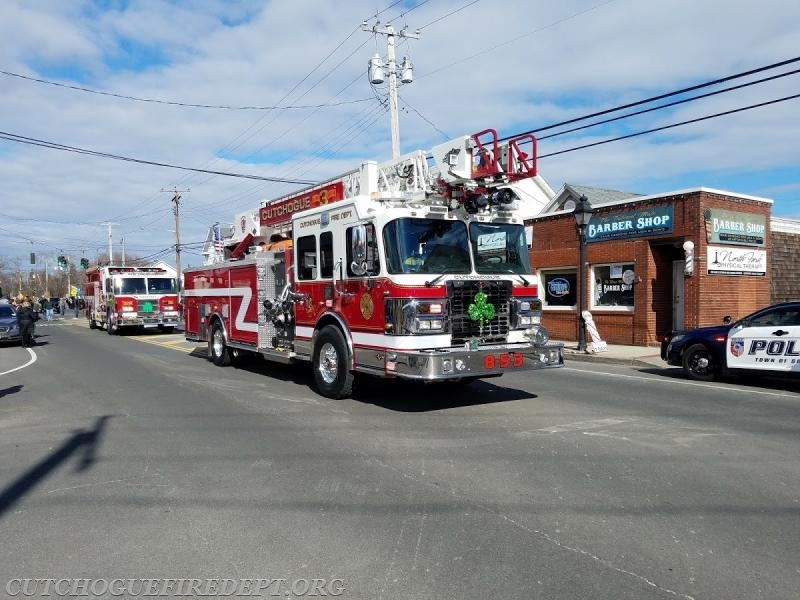 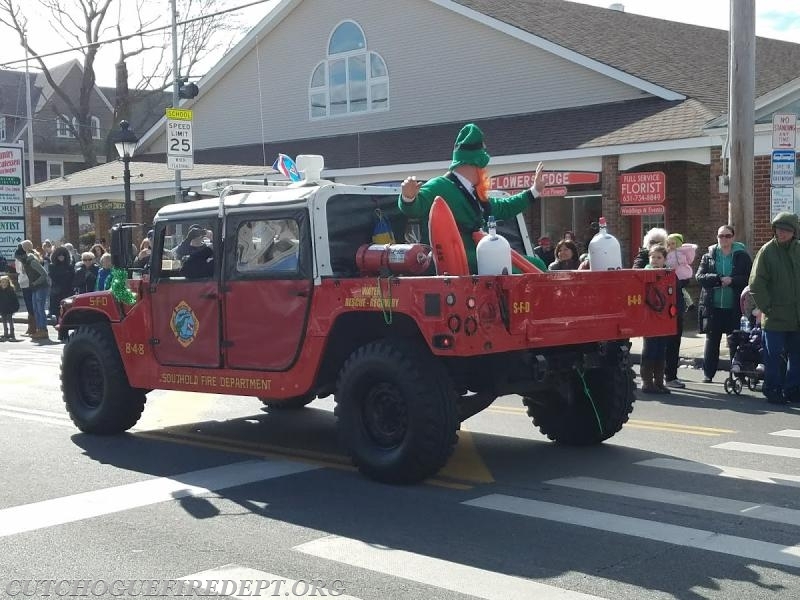 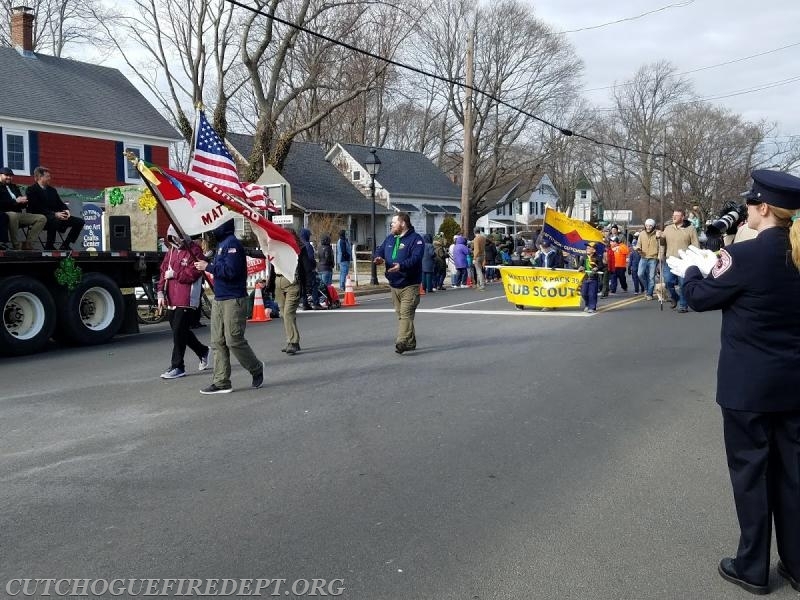 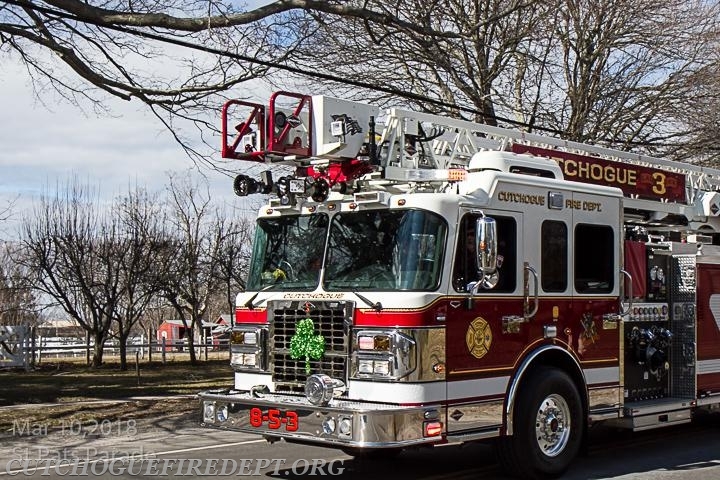 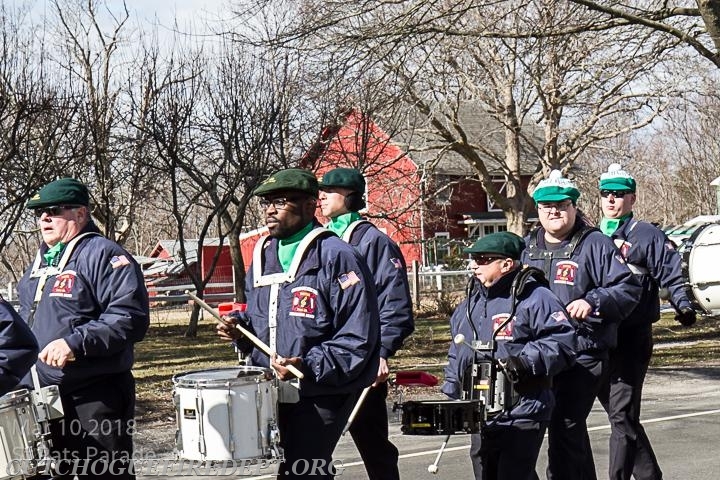 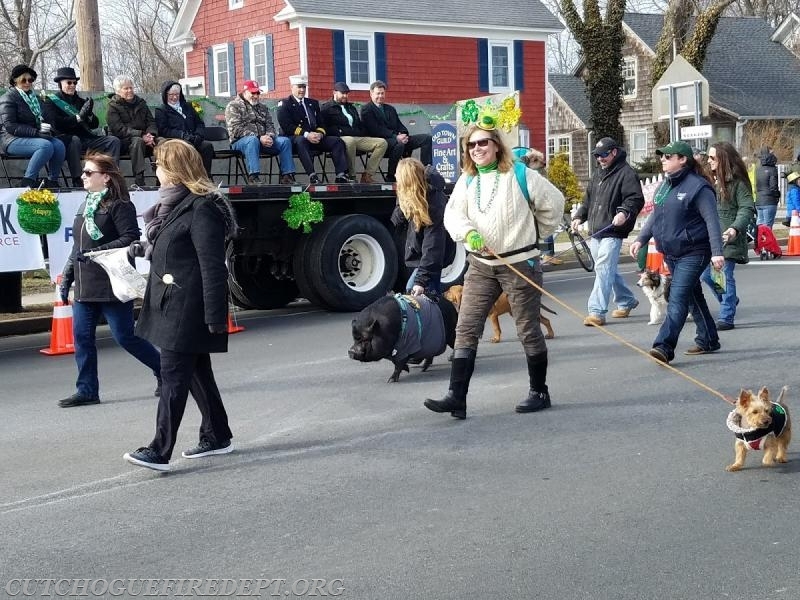 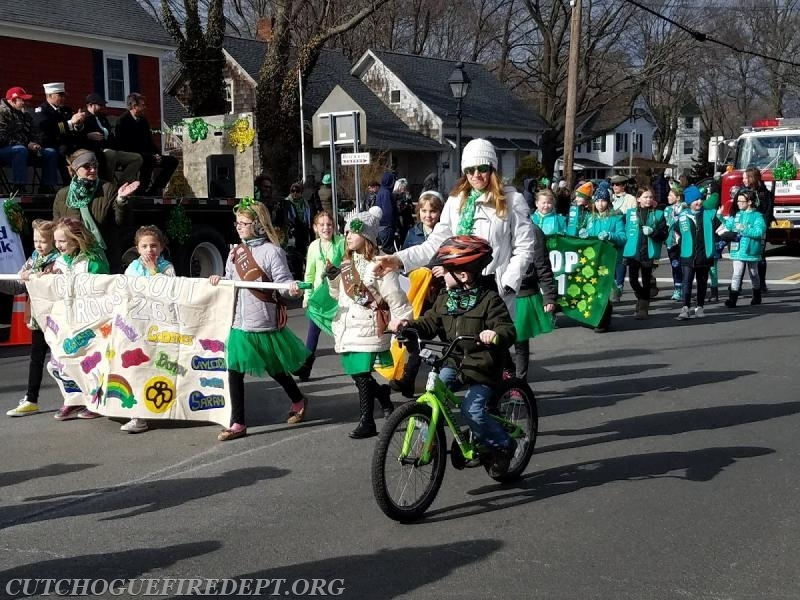 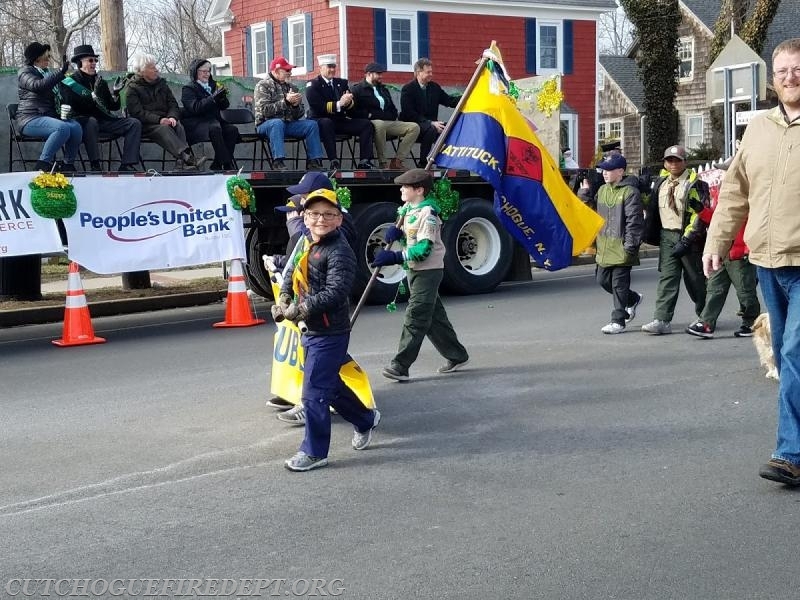 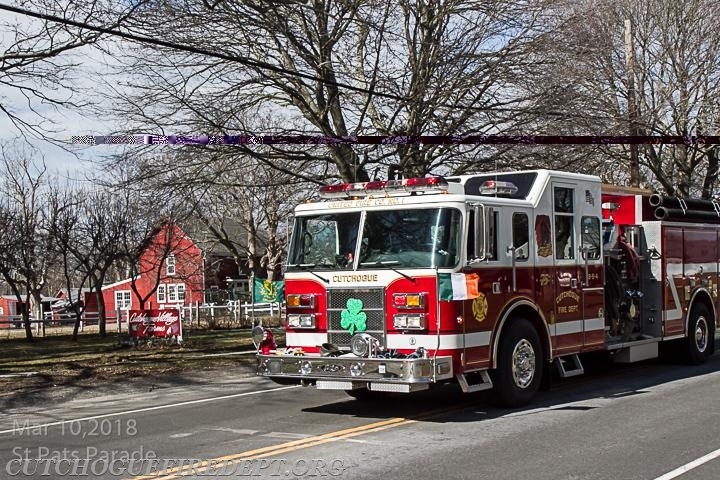 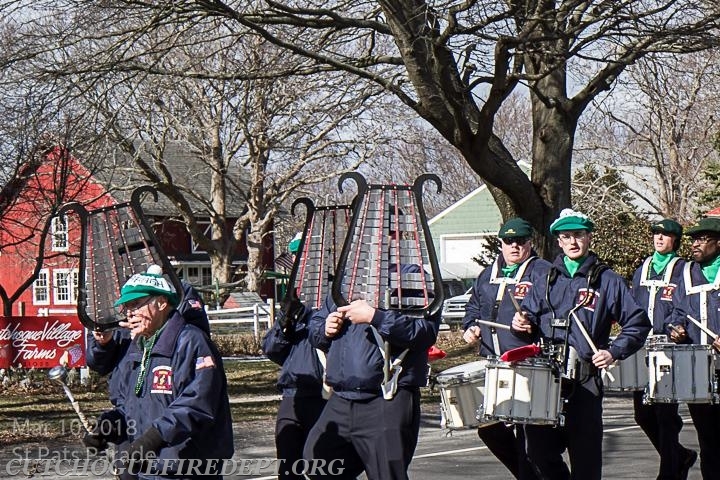 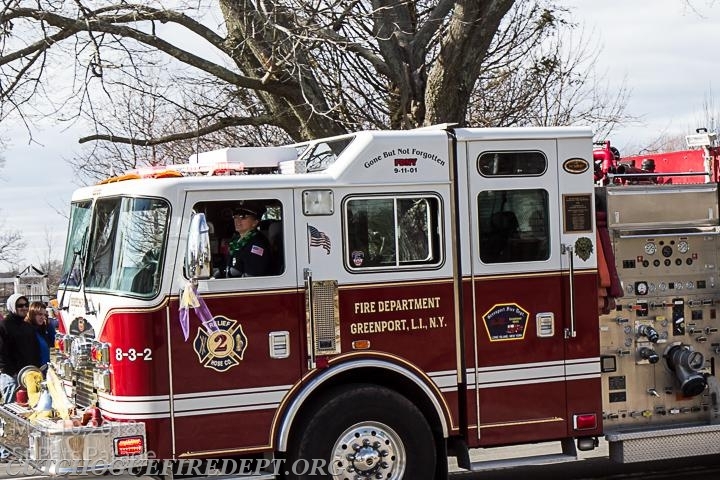 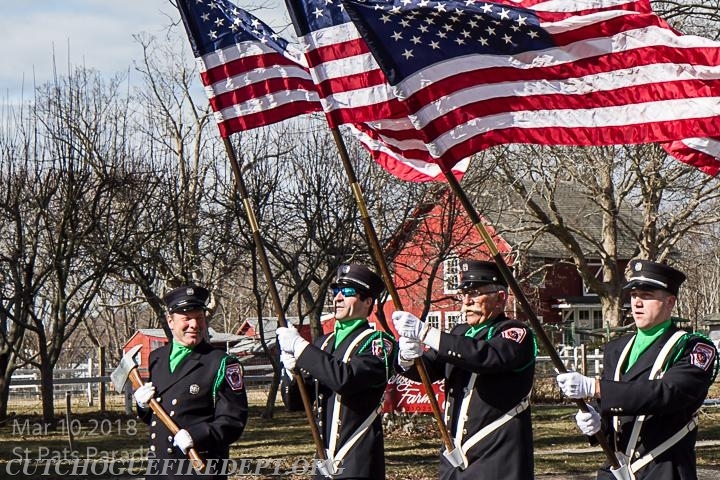 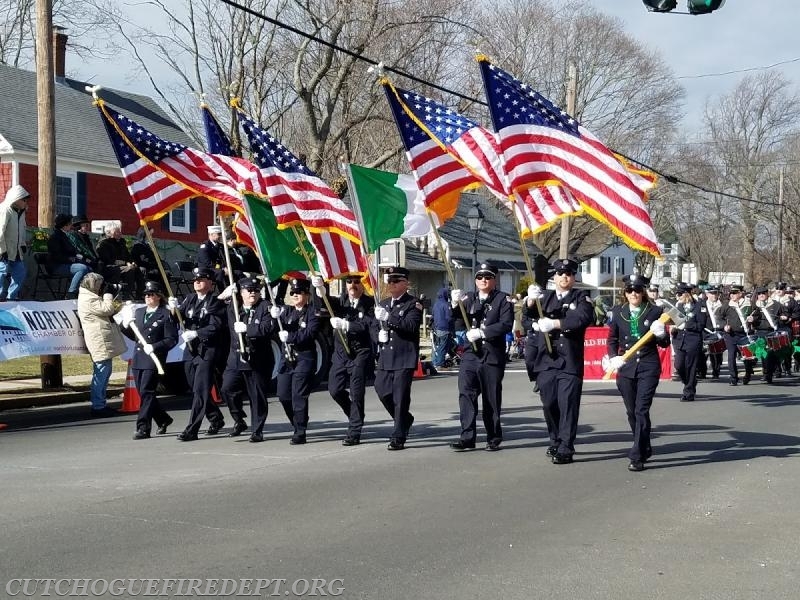 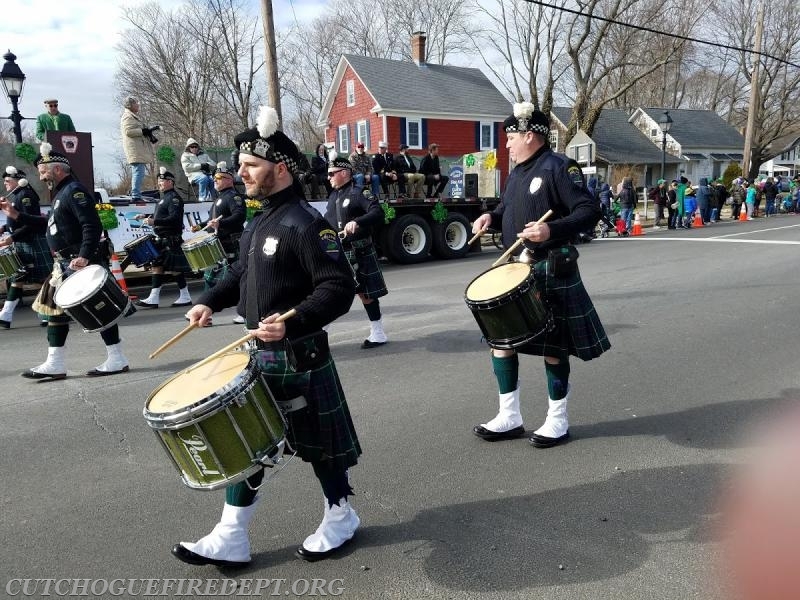 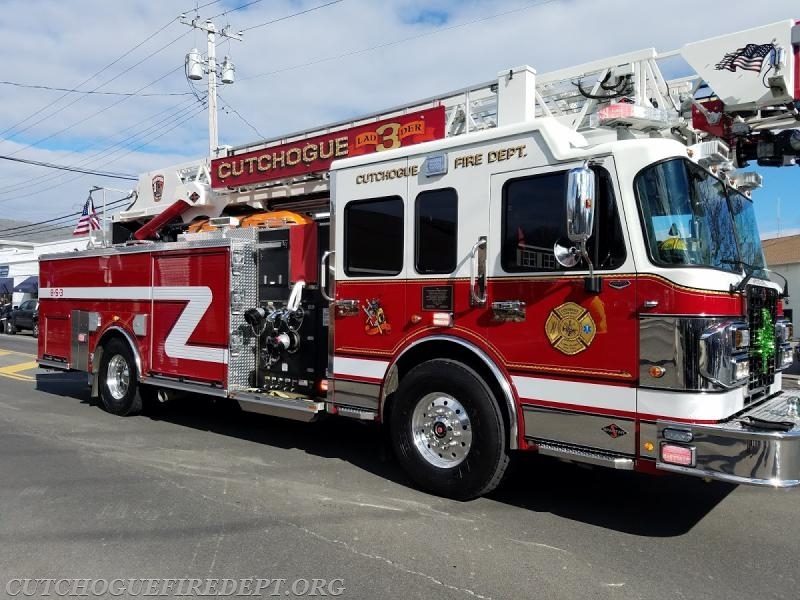 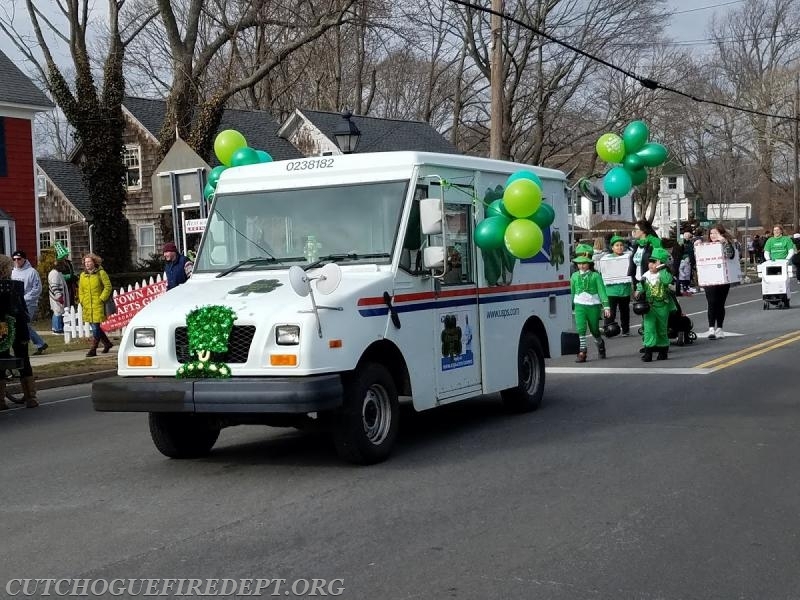 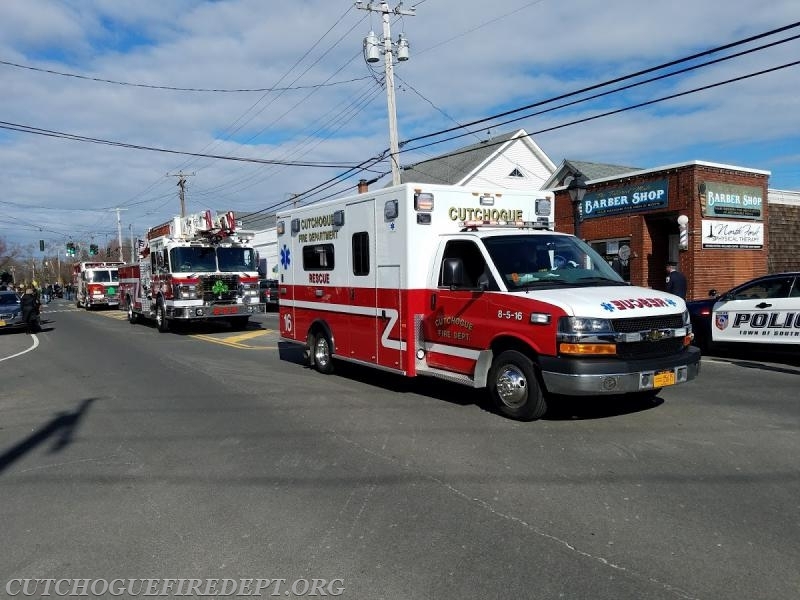 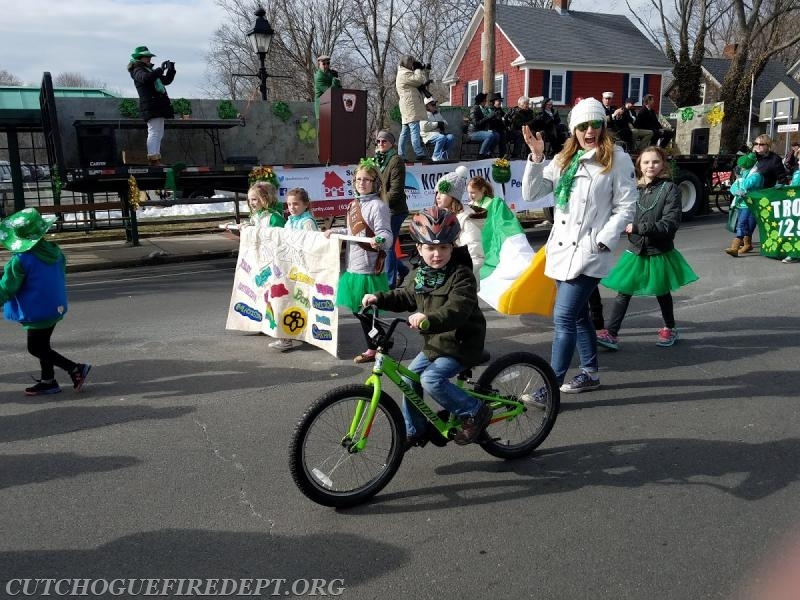 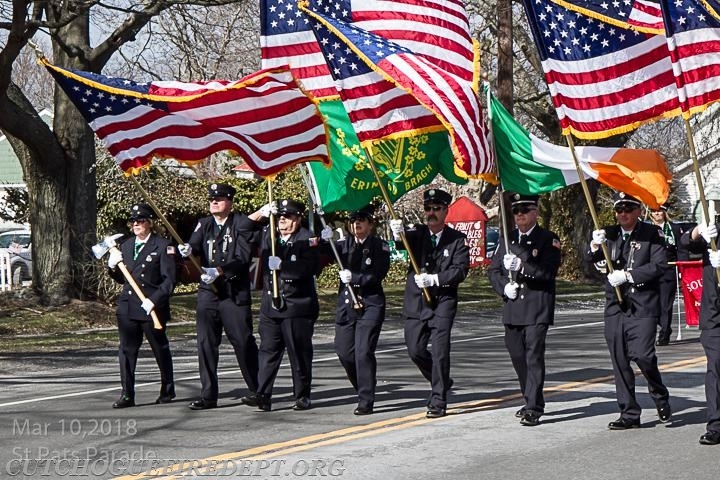 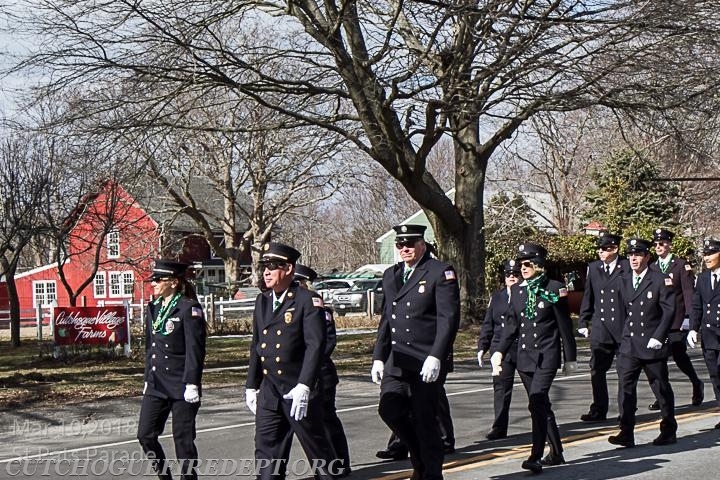 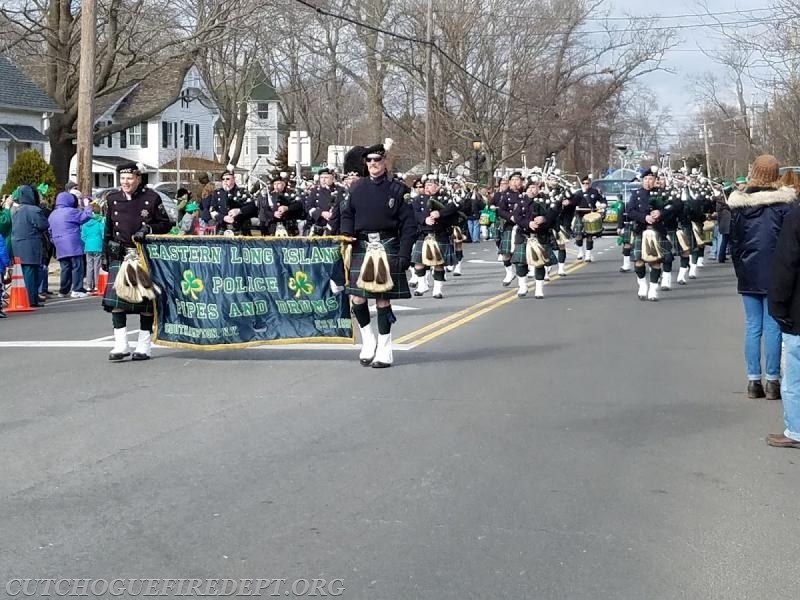 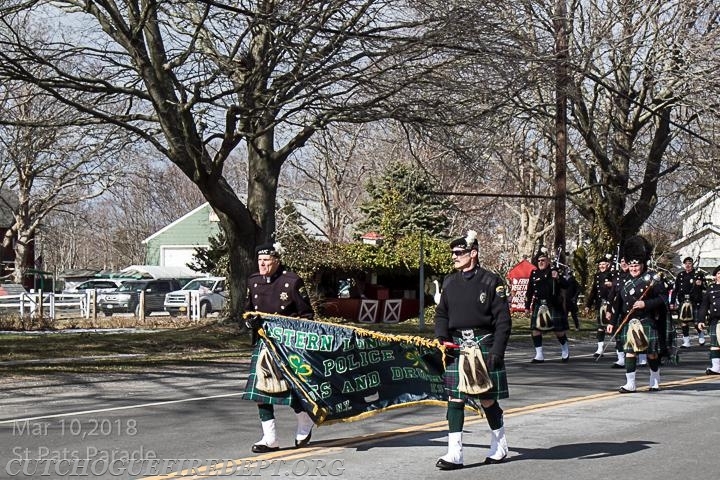 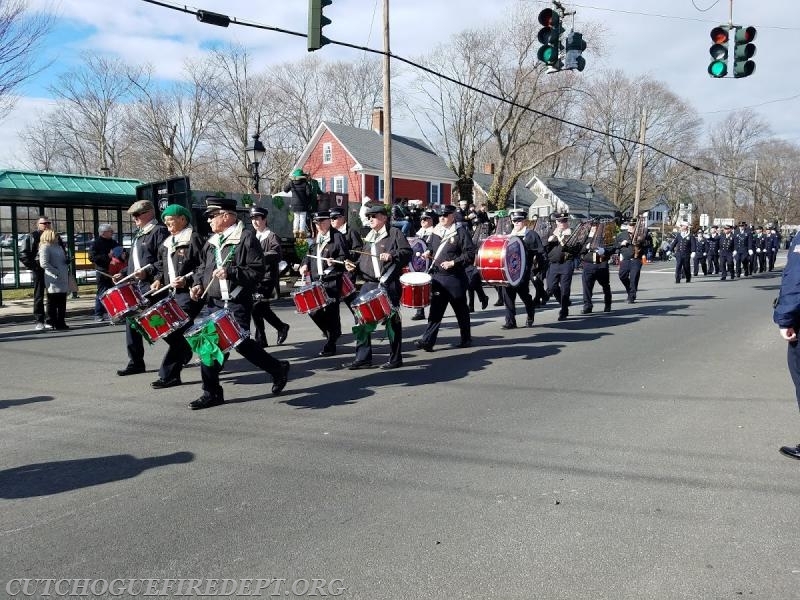 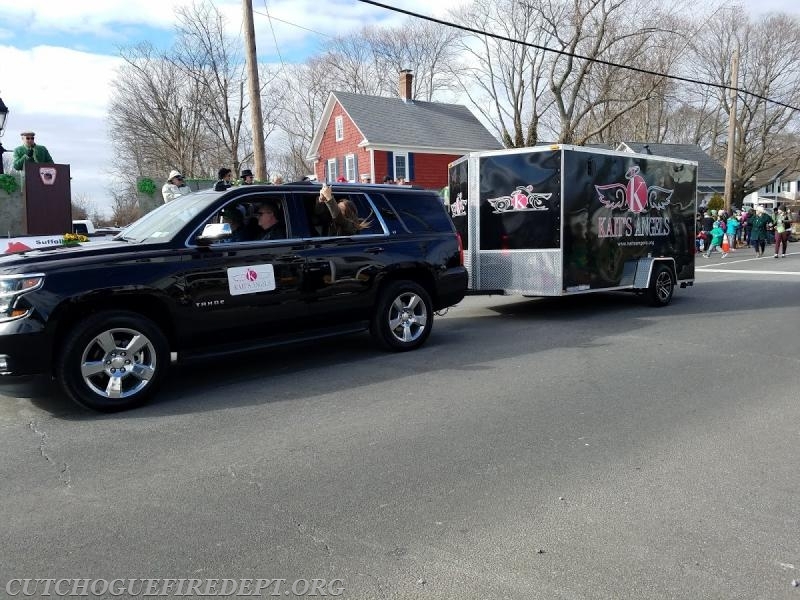 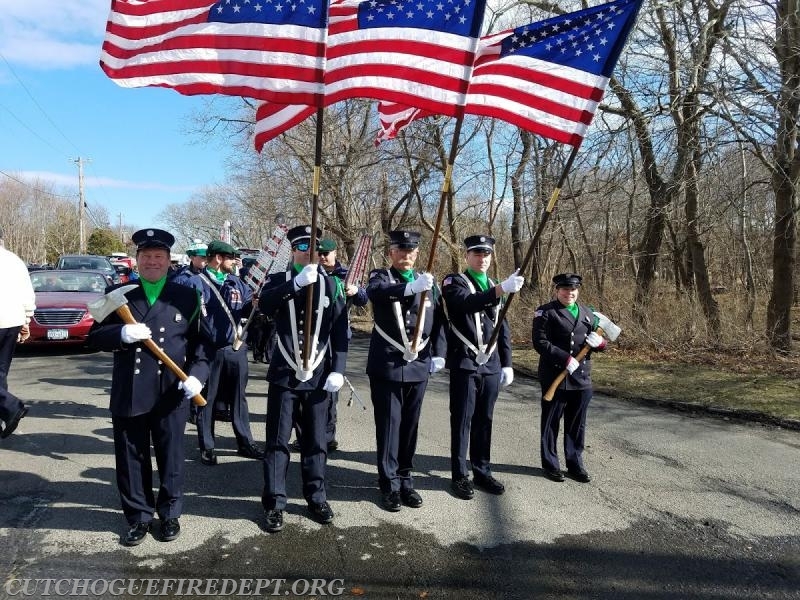 The North Fork Chamber of Commerce in conjunction with the Cutchogue Fire Department held its Annual Cutchogue St. Patrick's Day Parade. 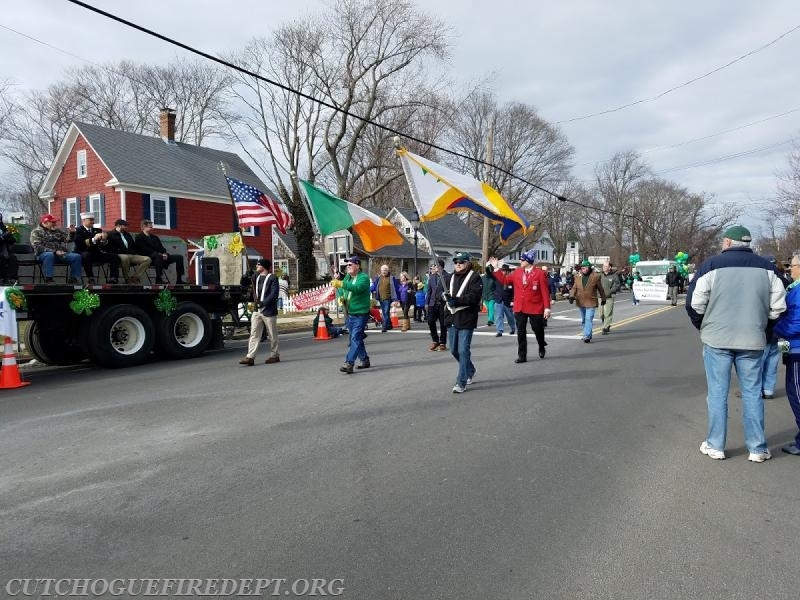 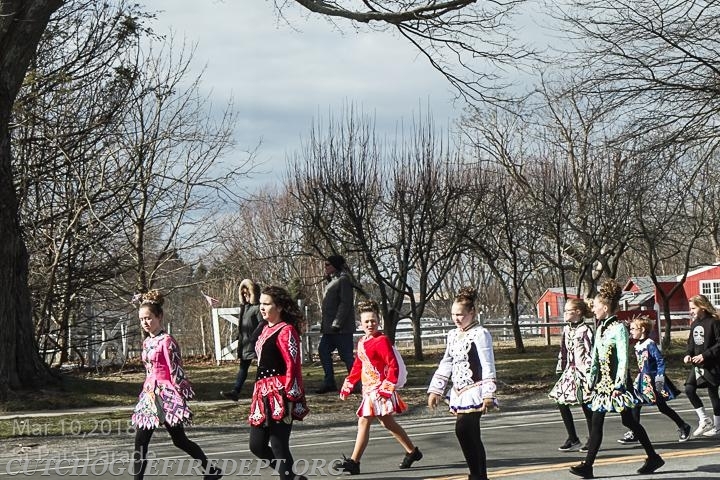 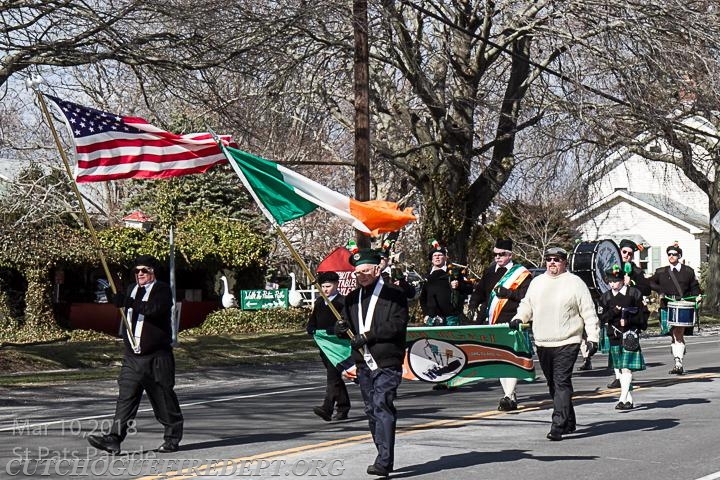 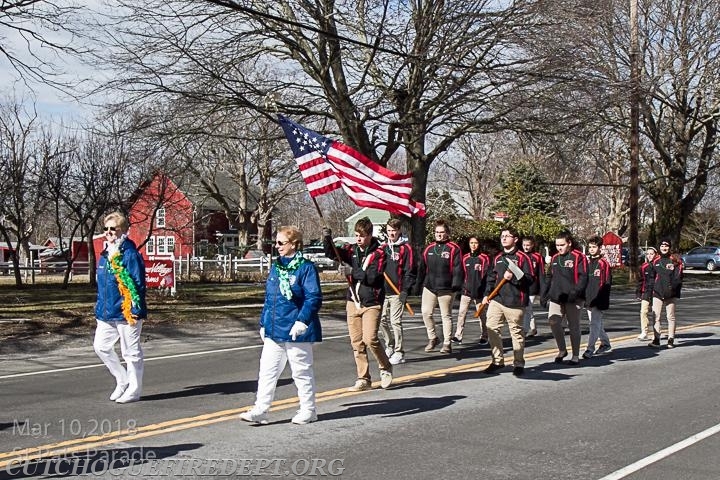 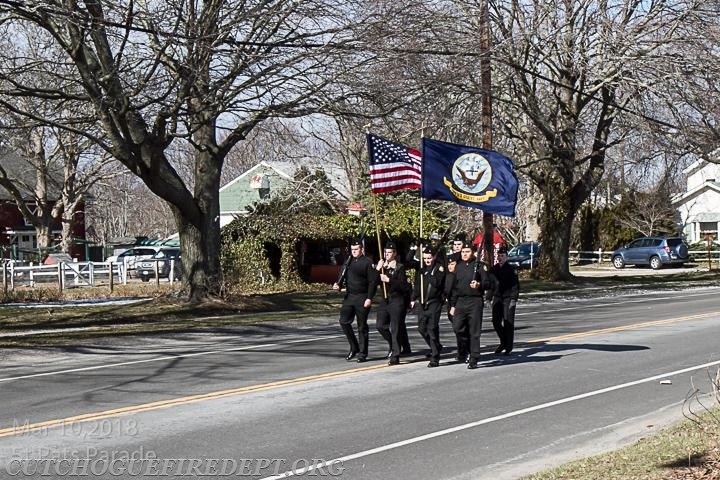 The parade began at 2:00 p.m., marching down Route 25 through the heart of Cutchogue Village. 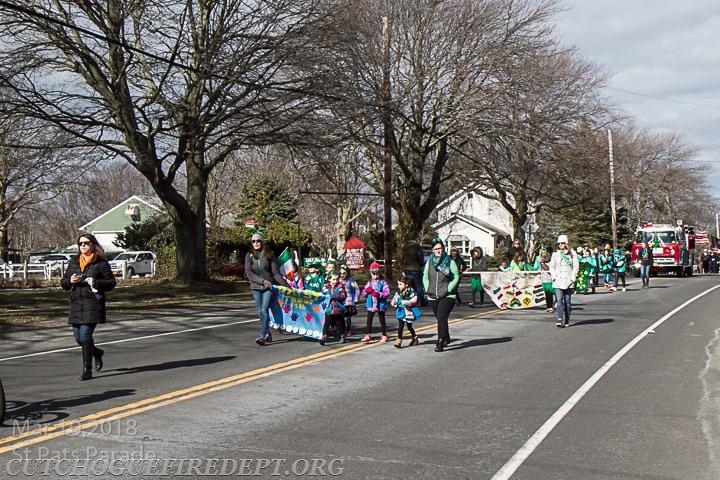 The annual parade which is now 14 years old, continues to grow each year. 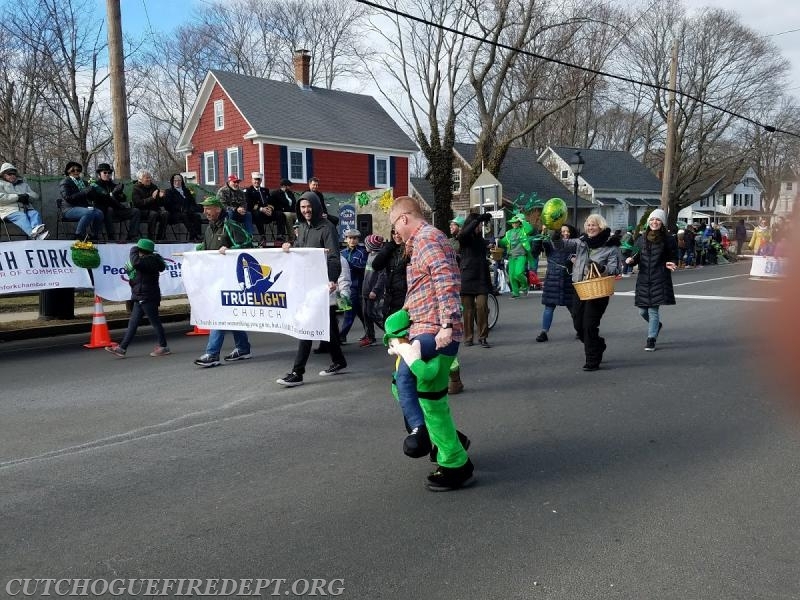 This year was no exception as the parade was well attended and had crowds of people lining the mile long parade route. 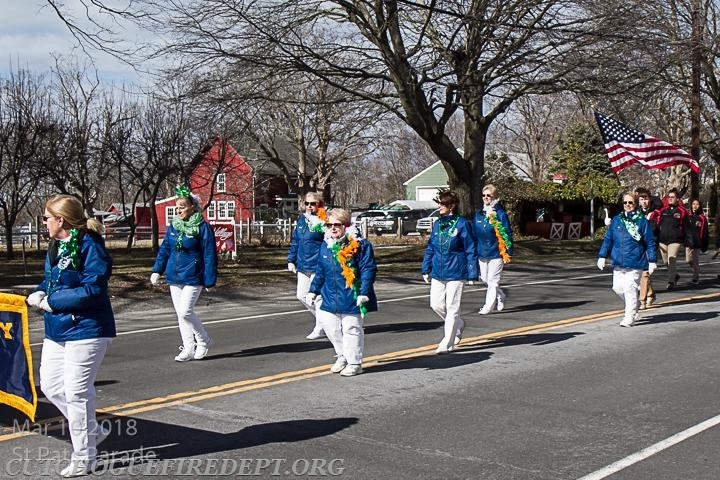 After experiencing weeks of stormy weather, Parade-goers were blessed with near perfect weather with sunny skies and temperatures reaching 40+ degrees. 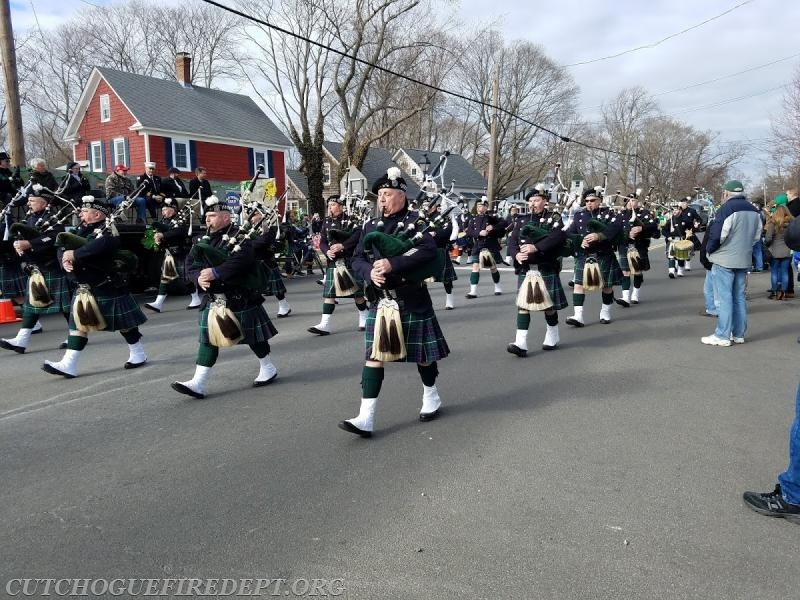 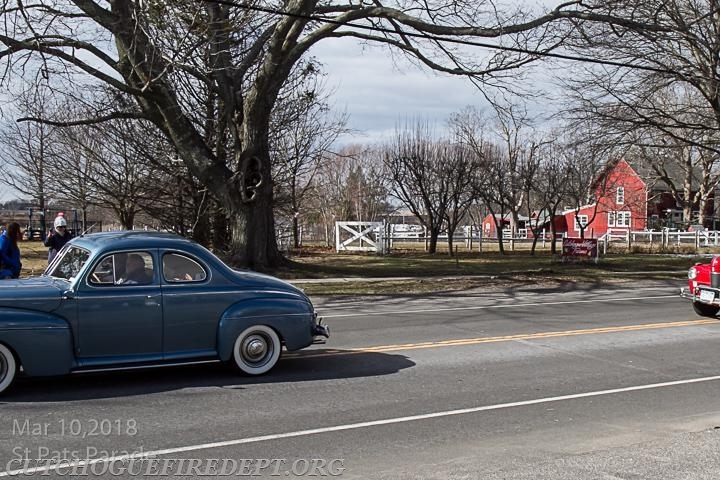 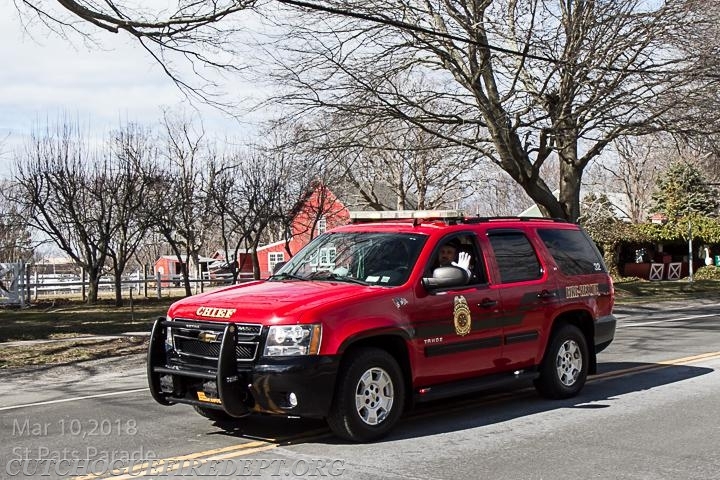 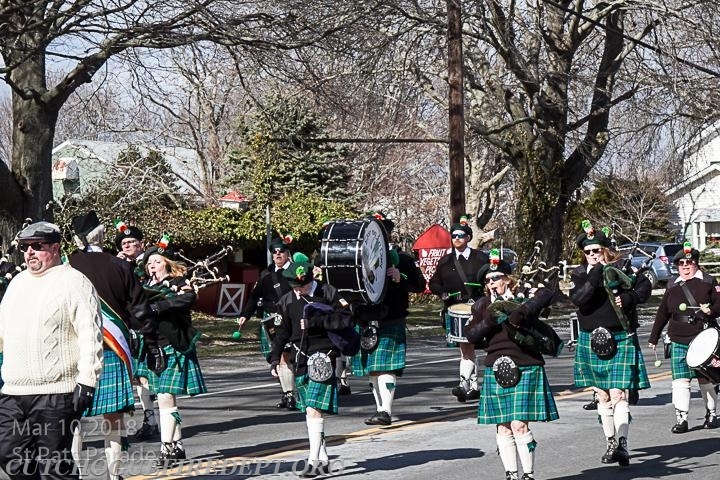 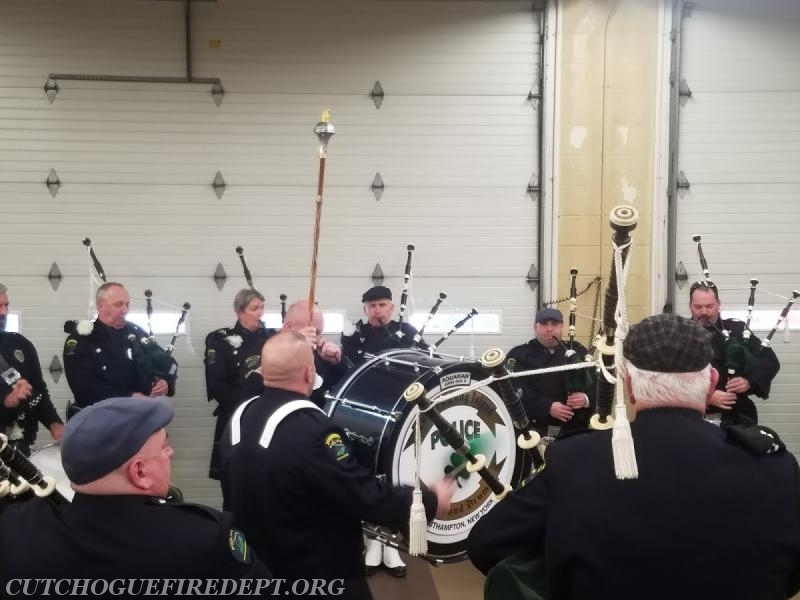 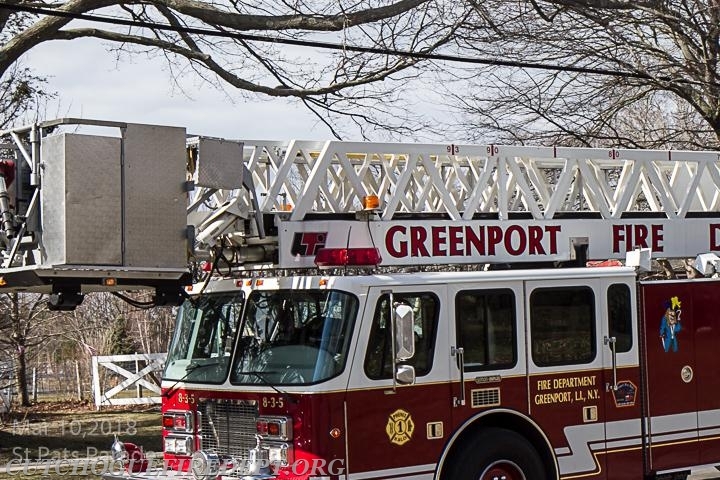 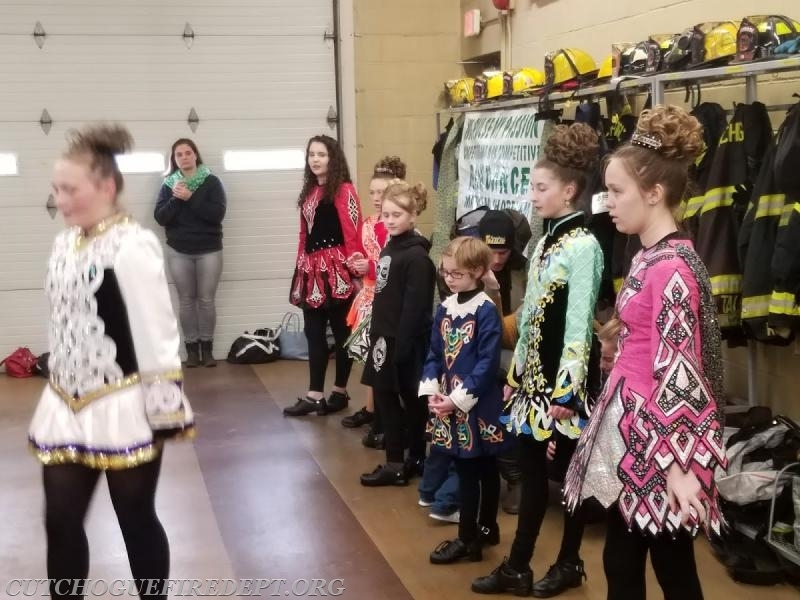 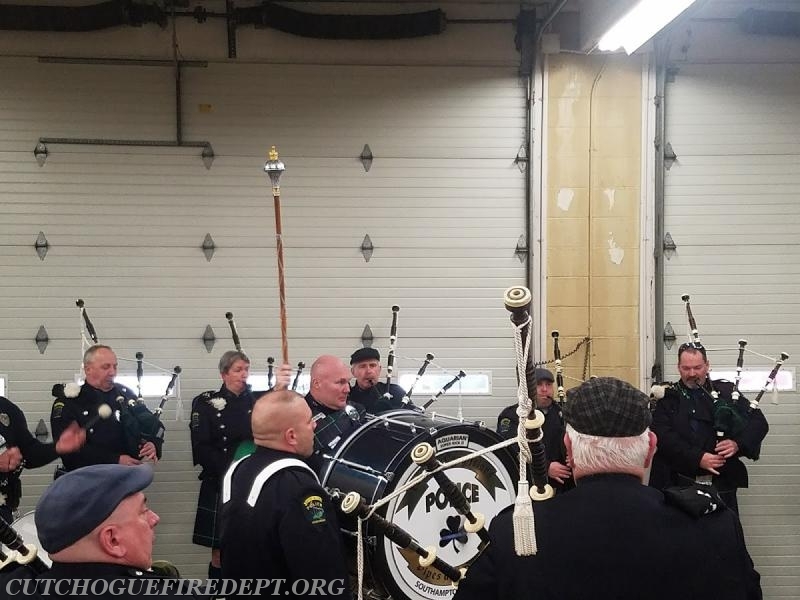 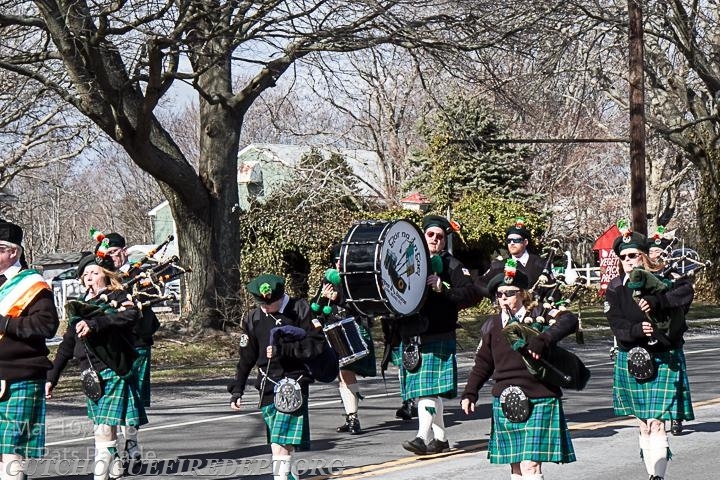 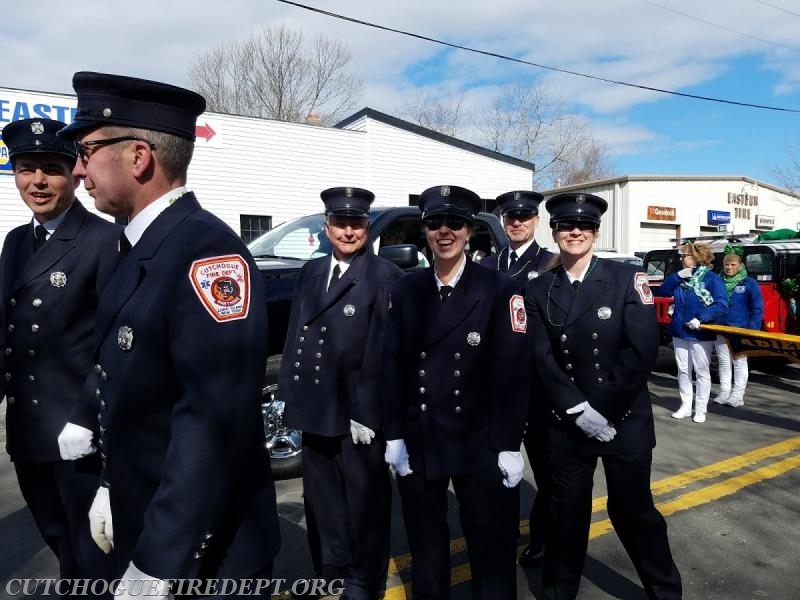 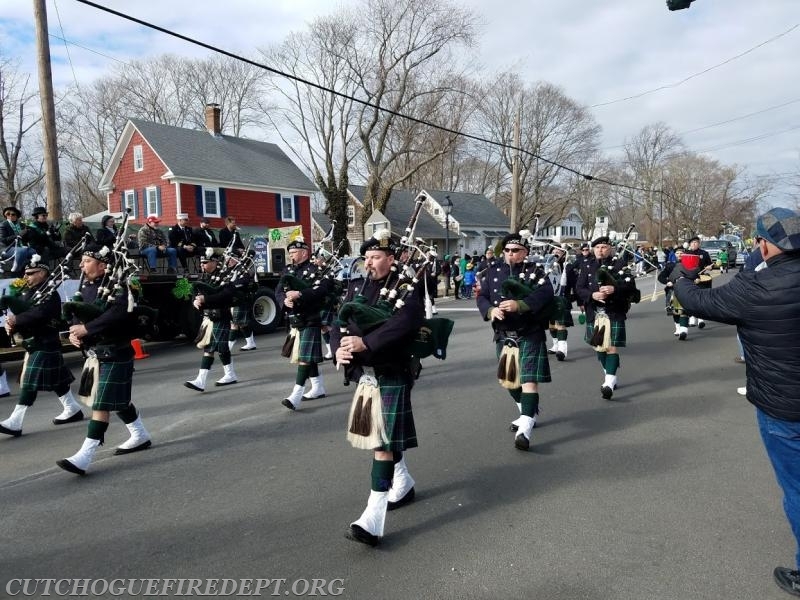 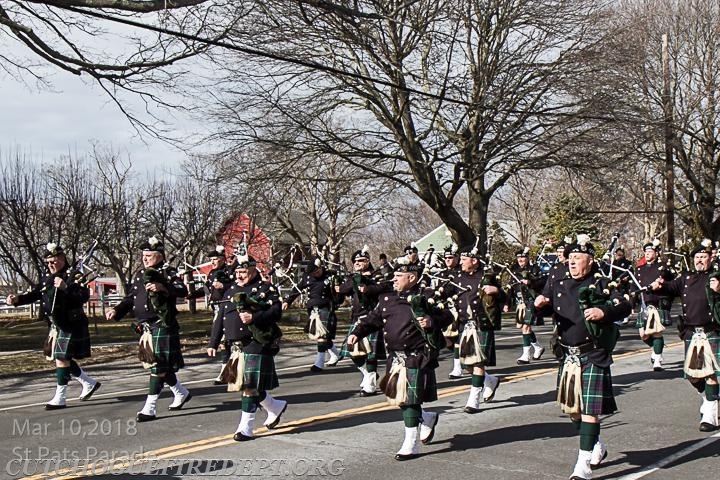 This year's participants included the local Volunteer Fire Departments from the North Fork, numerous civic groups, scouting groups, youth groups, and of course Bag Pipe bands. 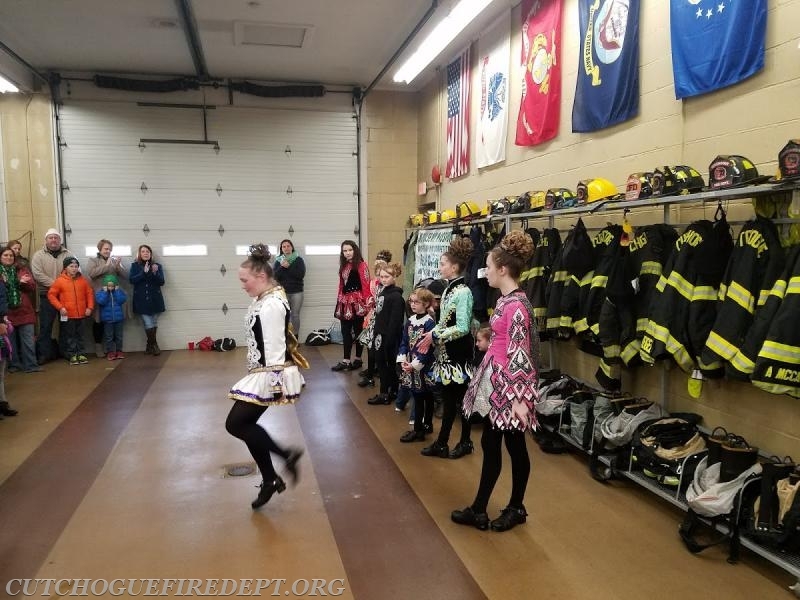 Following the parade, a reception was held at the Firehouse for all the participants, their families and the community. 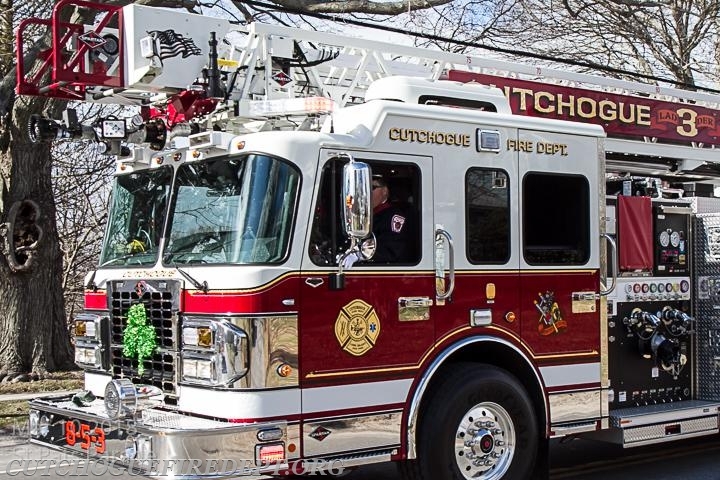 Hot dogs and refreshments were served by the members of the Cutchogue Fire Department and the CFD Ladies Auxiliary. 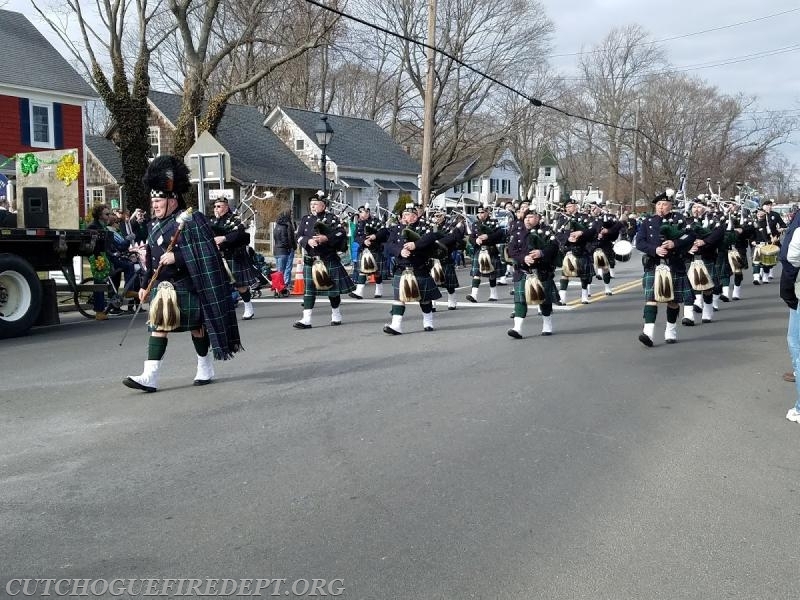 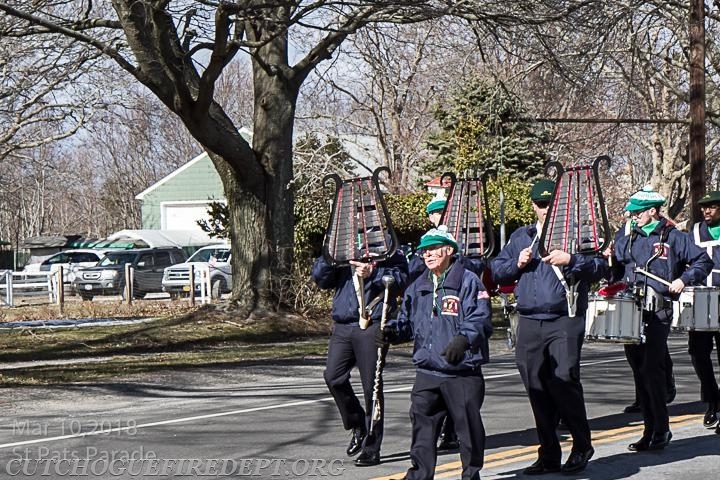 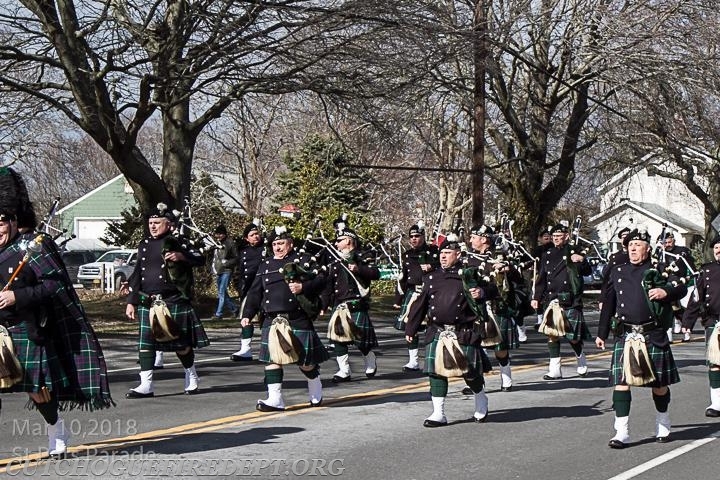 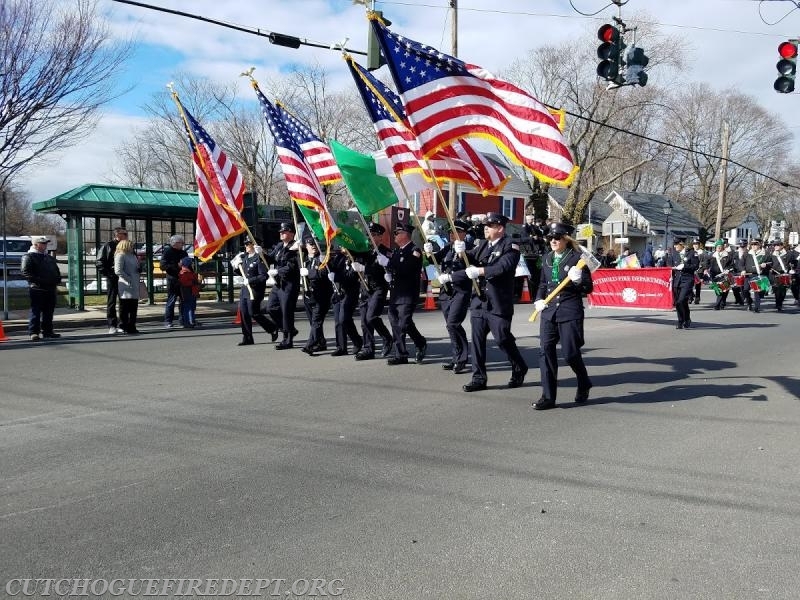 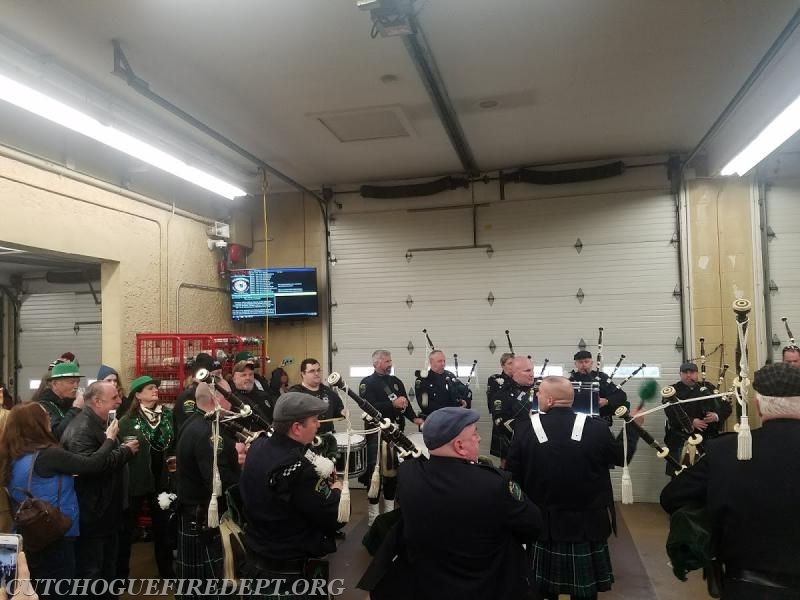 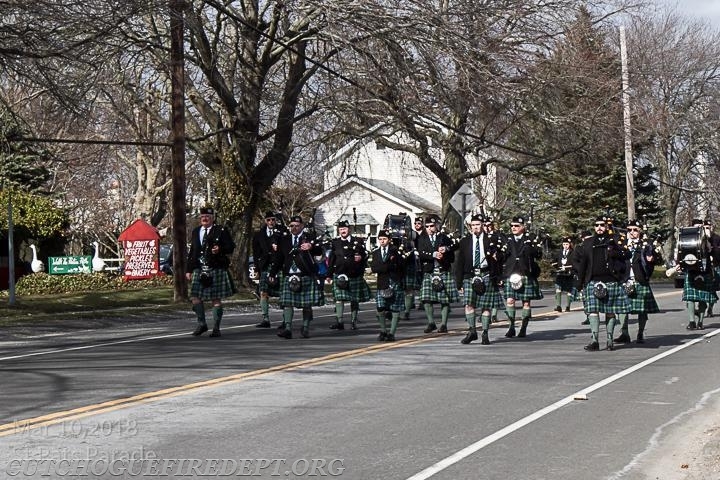 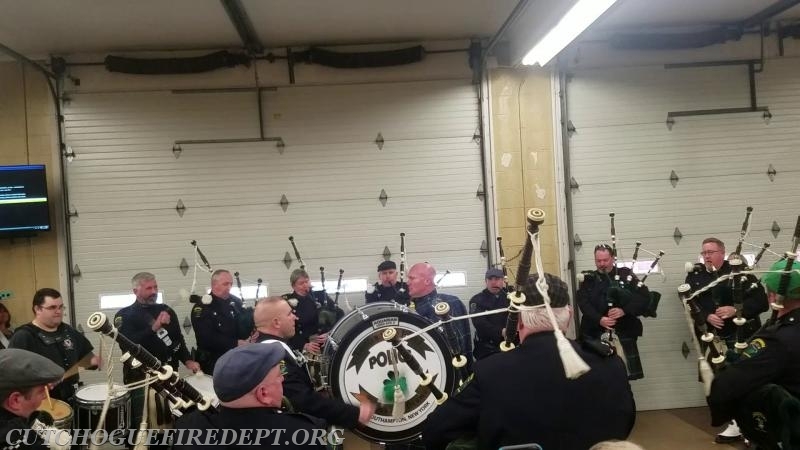 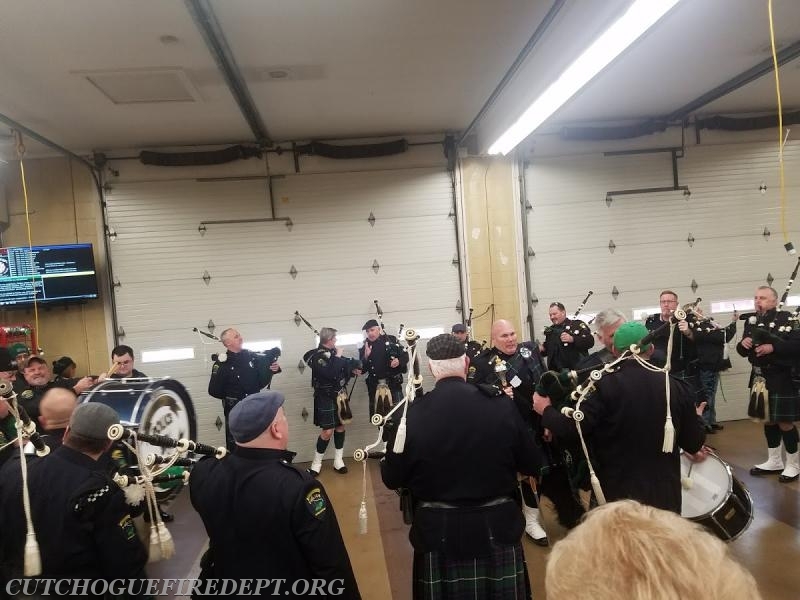 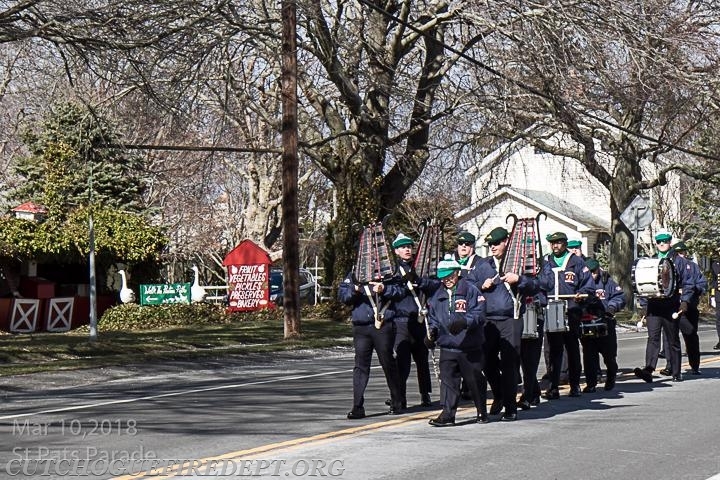 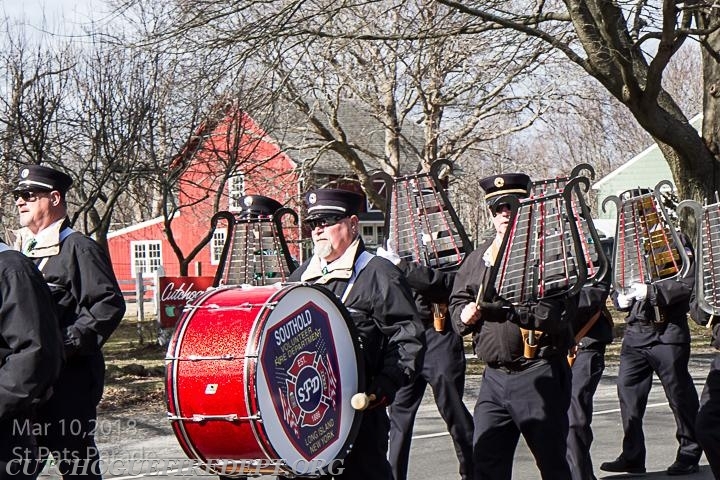 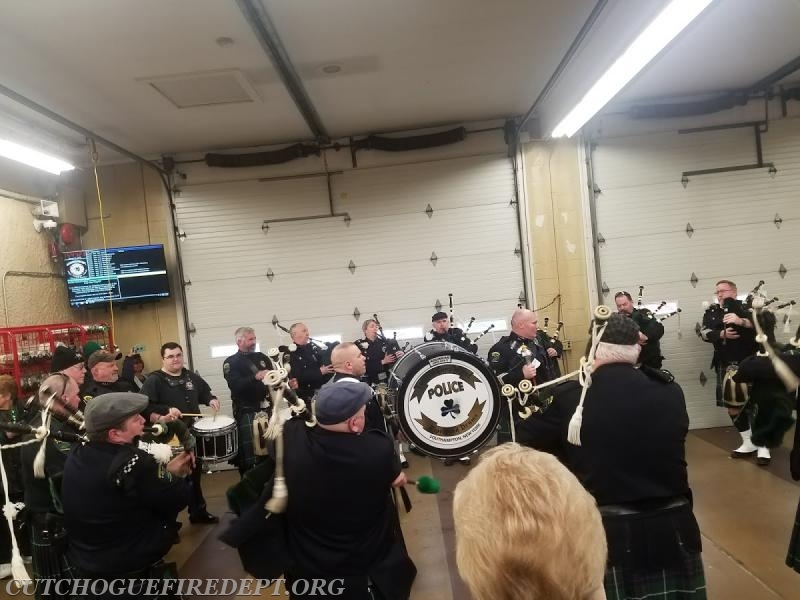 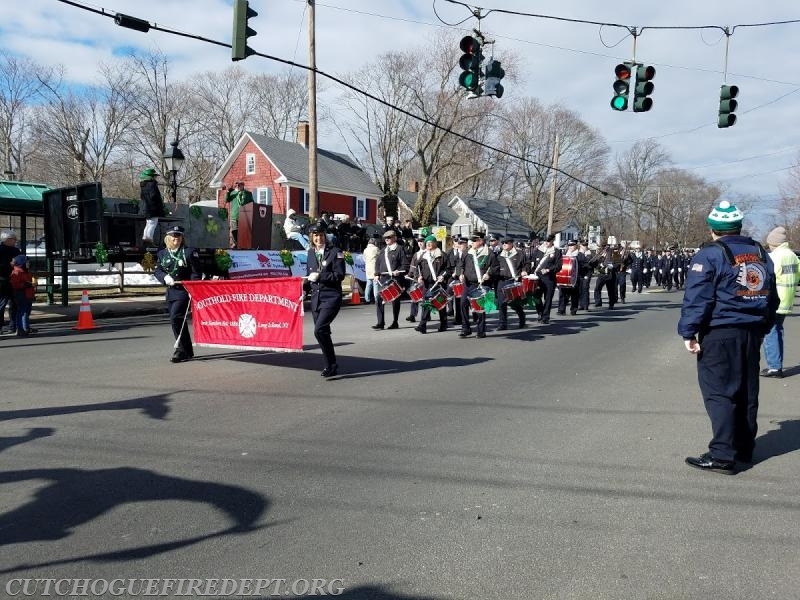 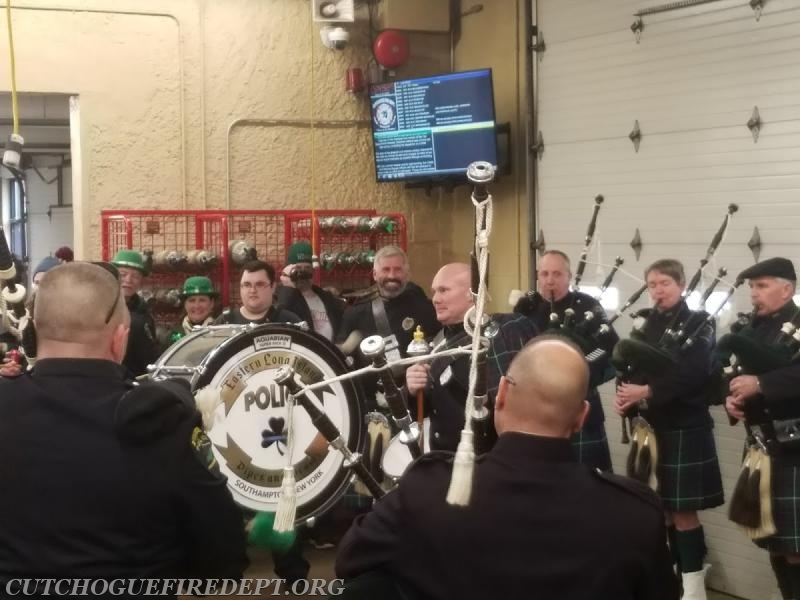 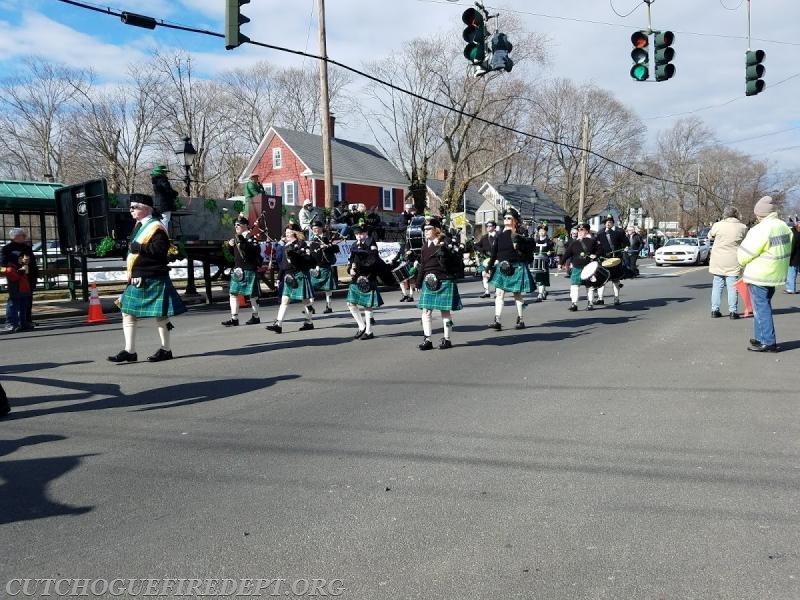 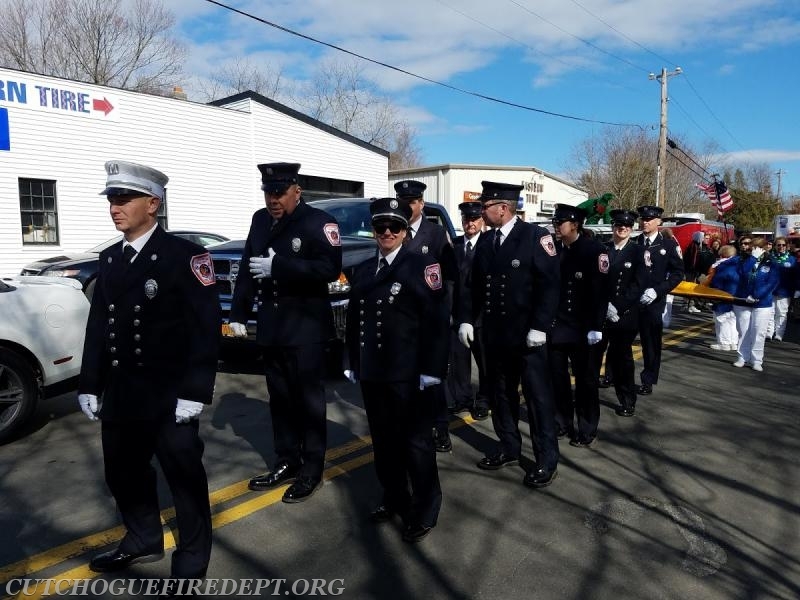 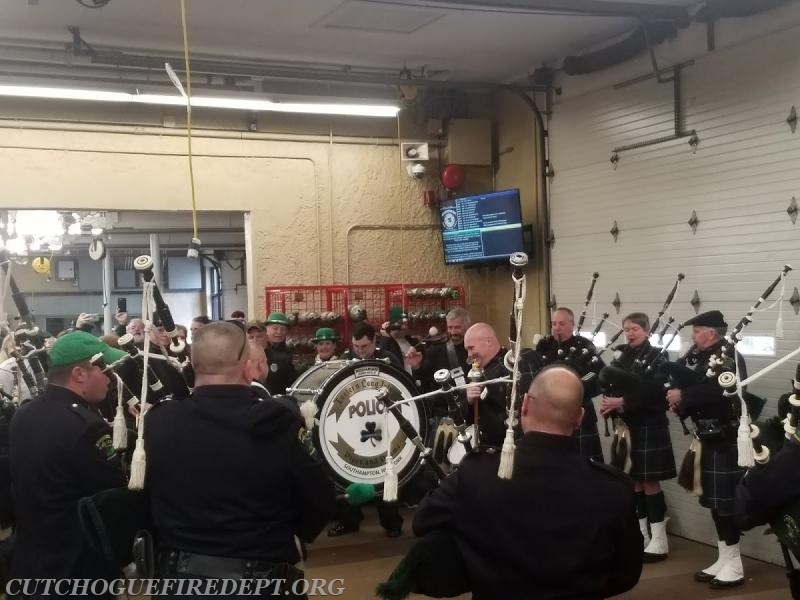 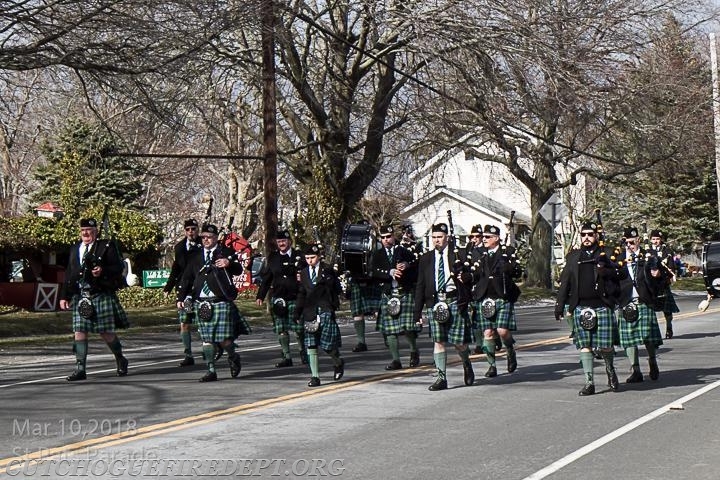 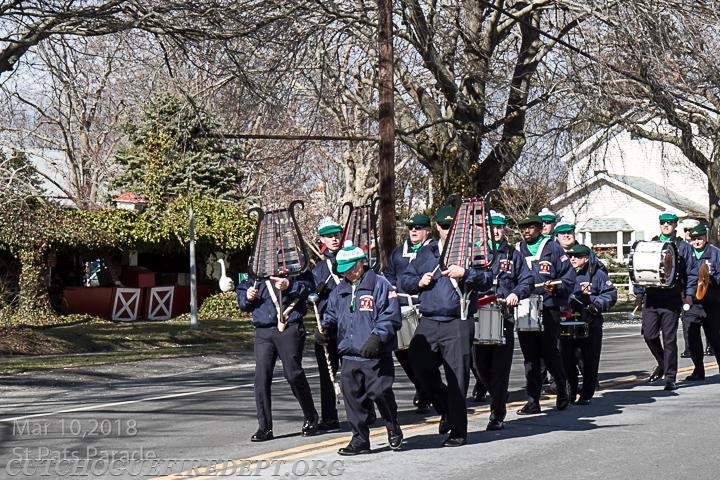 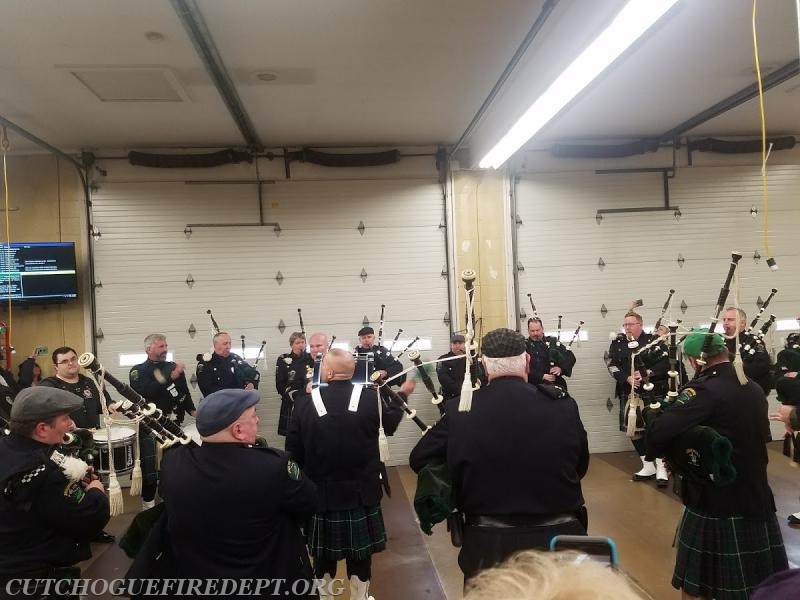 Those people who were at the firehouse were treated to a special performance given by the members of the Eastern Long Island Polkice Pipes and Drums corps that participated in the parade. 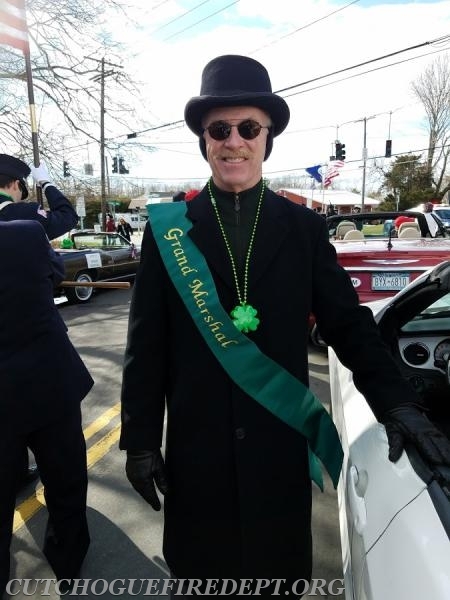 Each year the parade committee chooses a deserving community member to serve as the Grand Marshal for the parade. 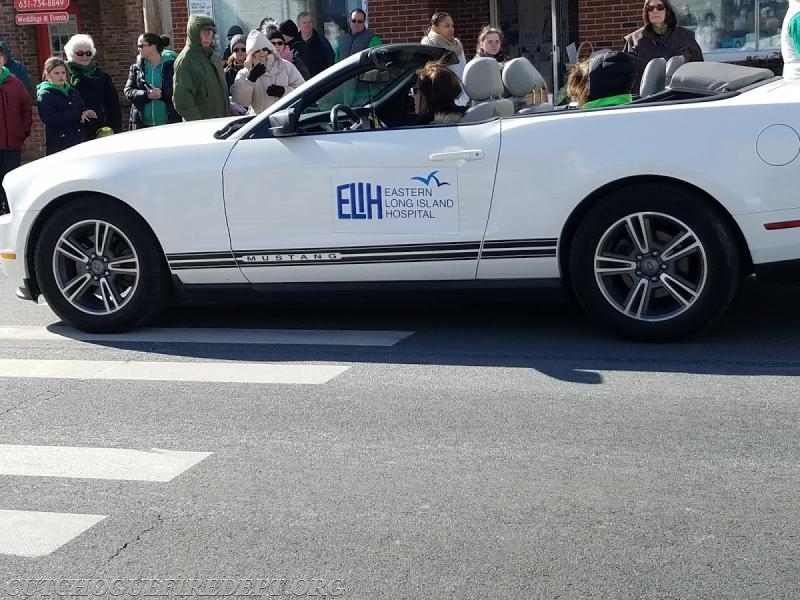 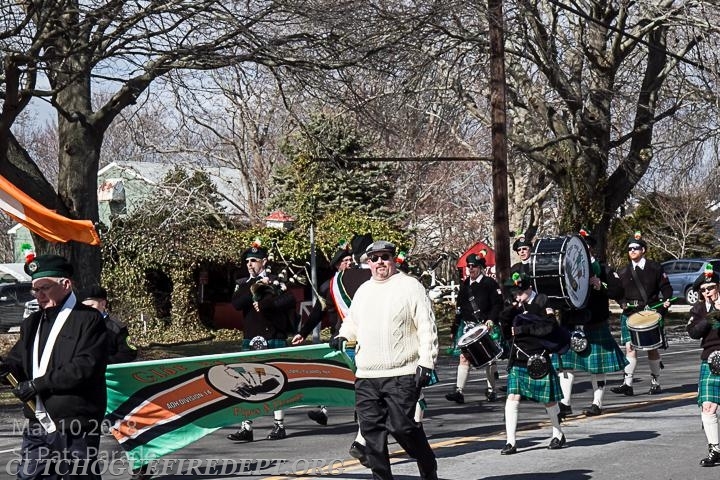 The Grand Marshal for this years parade was Paul Connor, the President CEO of Eastern Long Island Hospital. 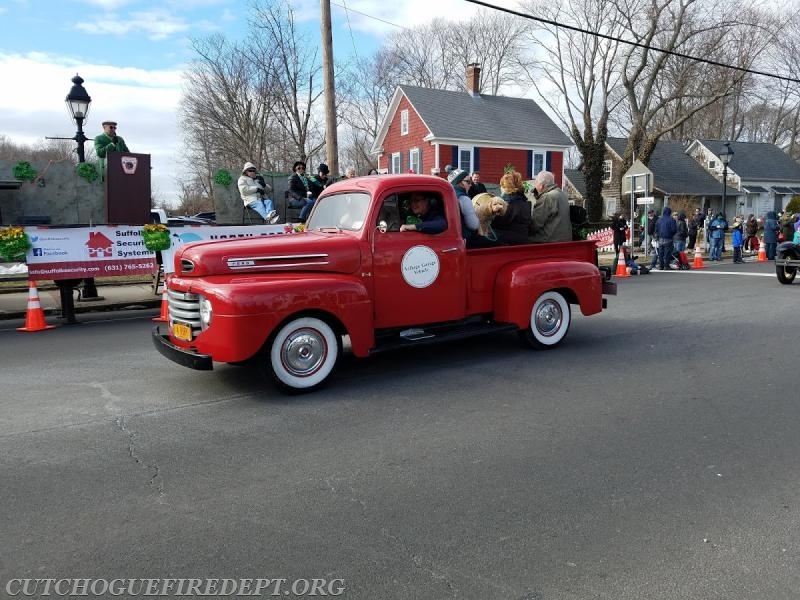 The Officers and Members of the Cutchogue Fire Department would like to congratulate Paul on his selection to be the 2018 Grand Marshal and ELIH's Support of the North Fork Communities. 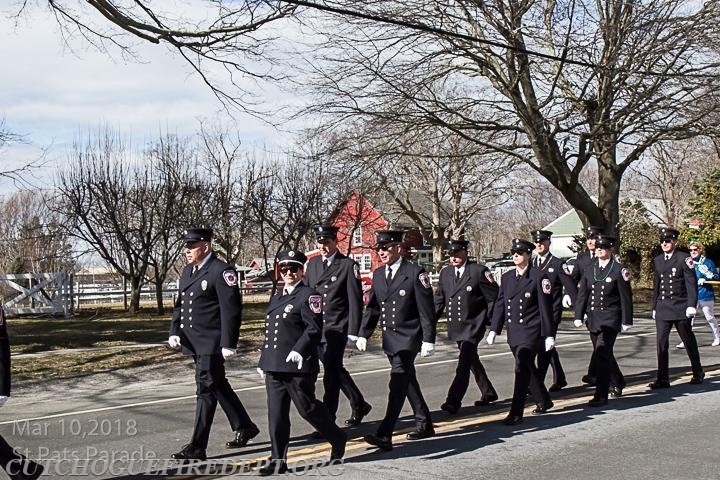 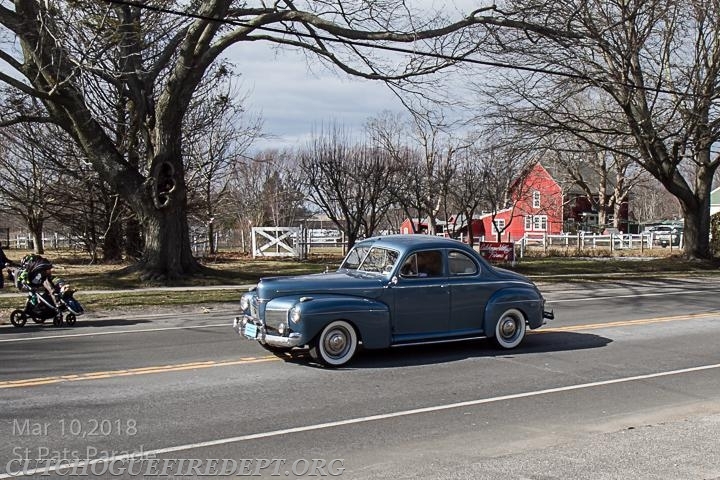 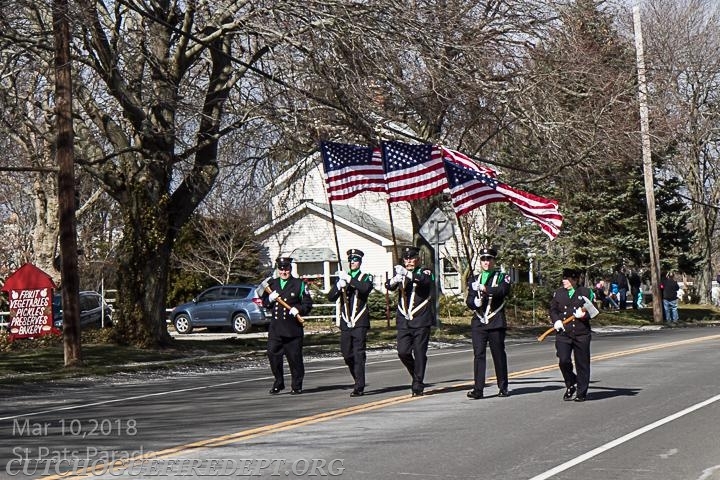 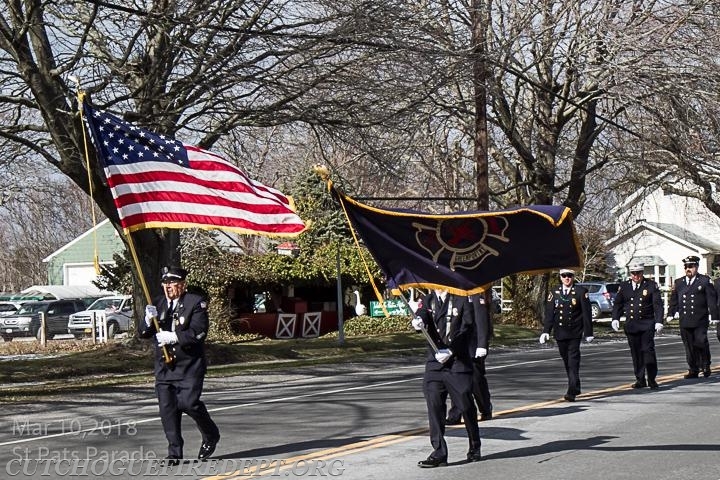 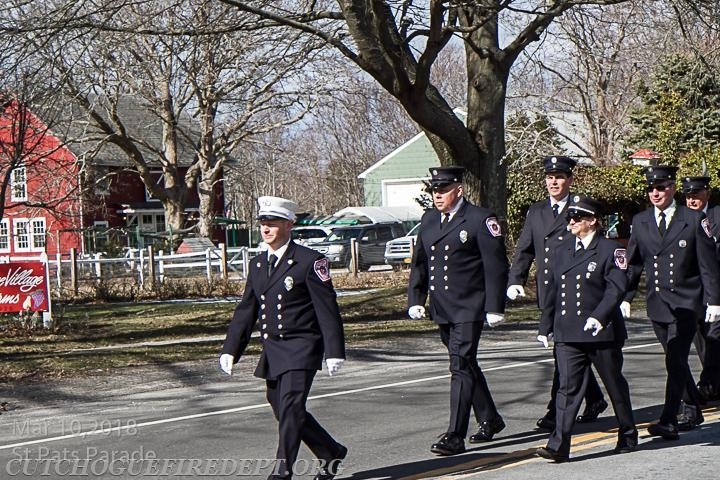 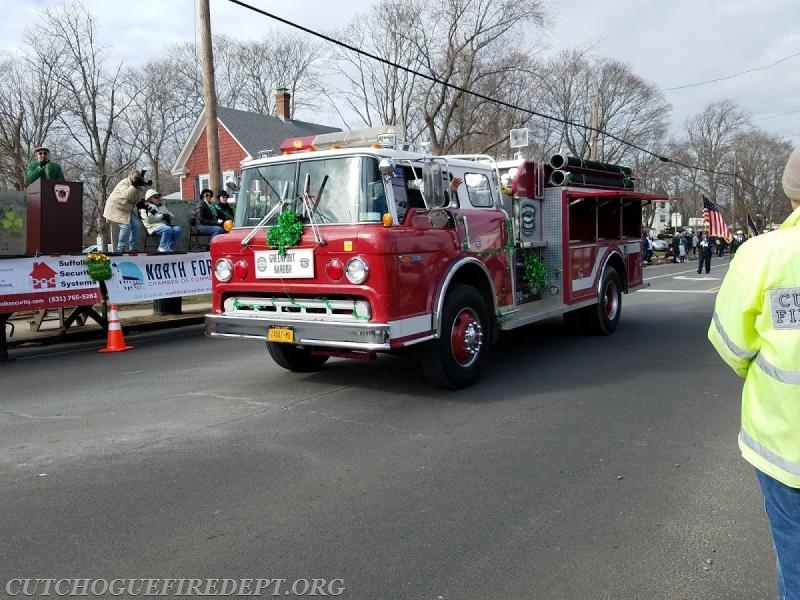 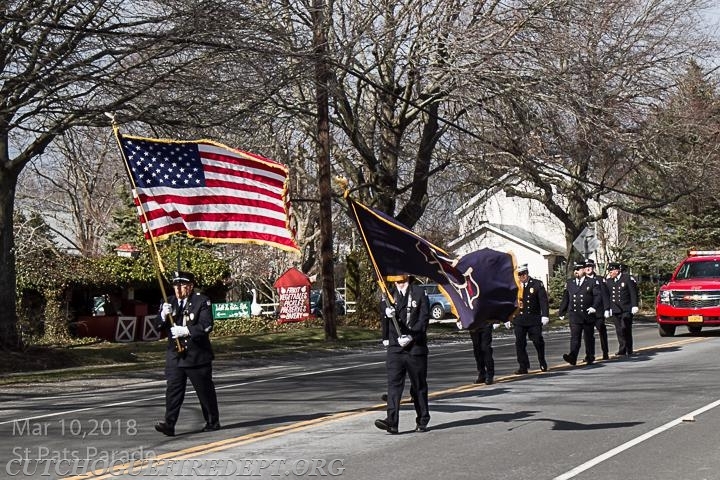 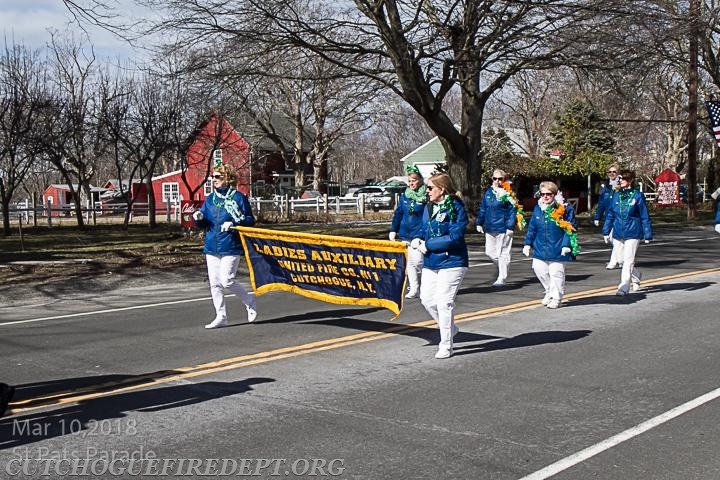 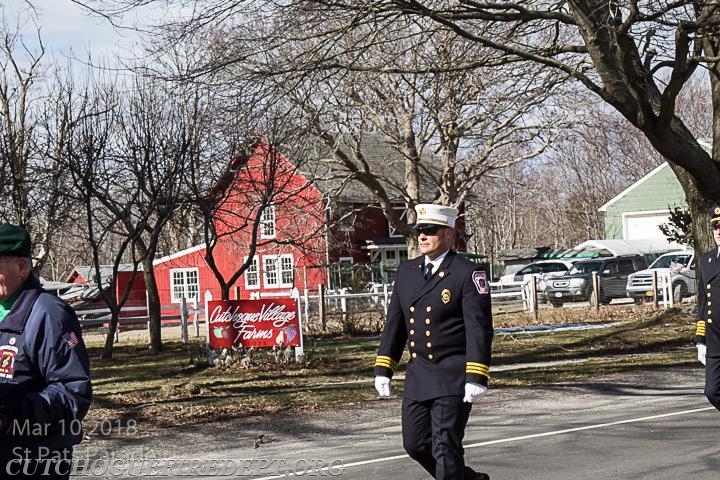 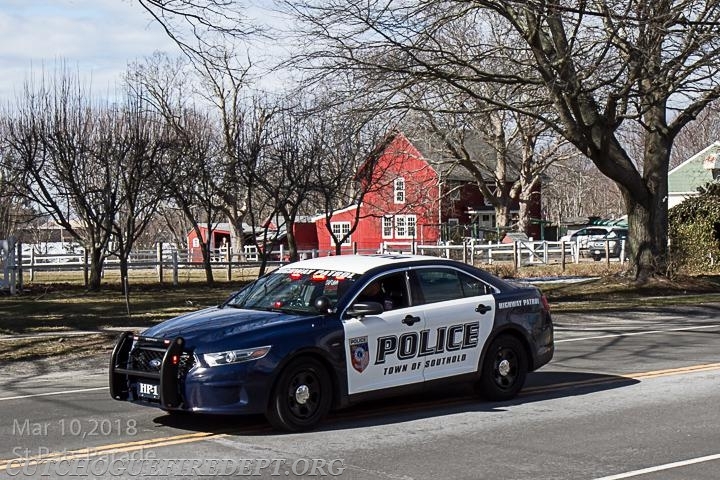 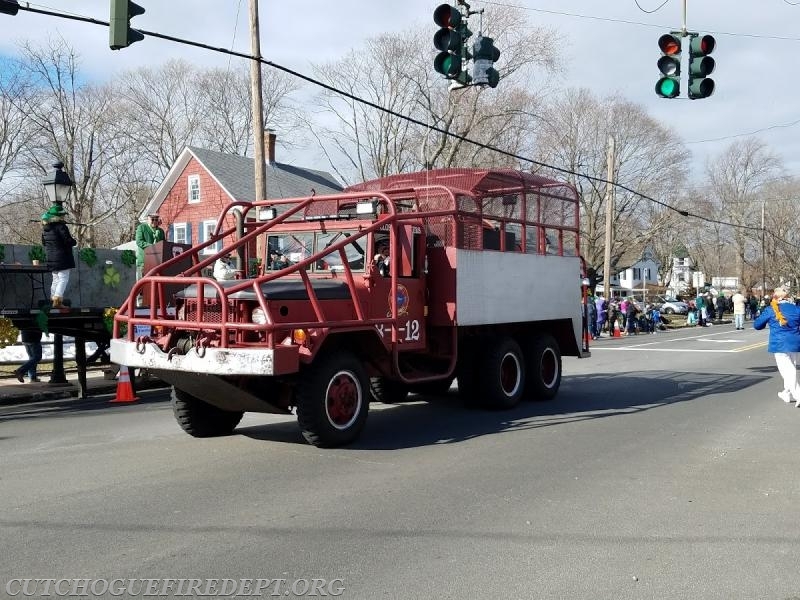 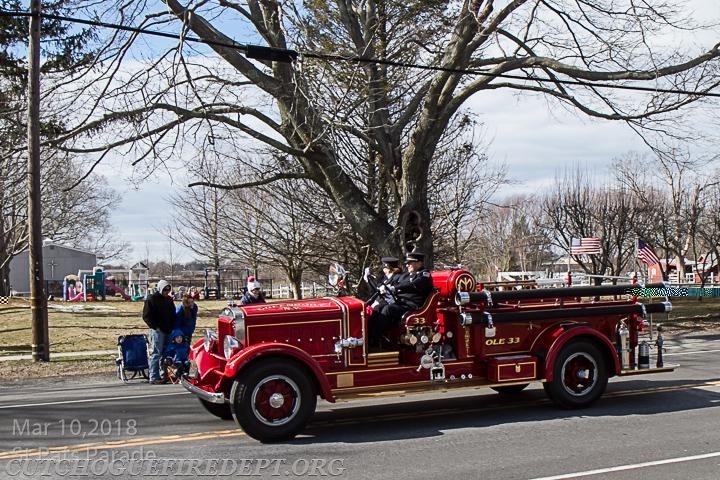 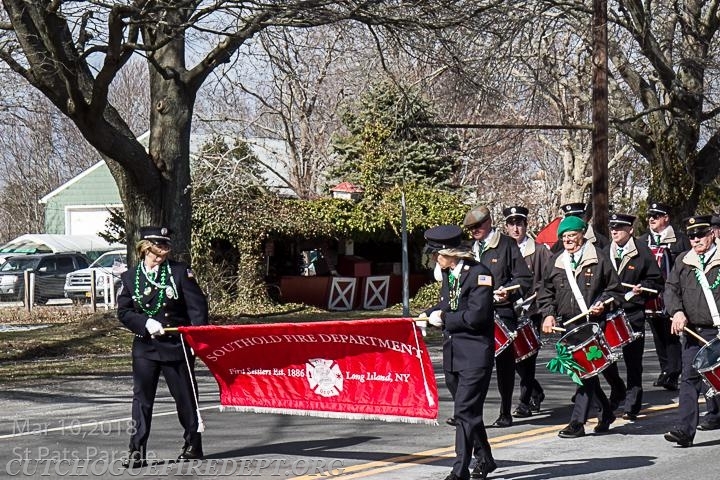 Thank You to everyone who helped to make this year's parade a success, including the 2018 parade committee, the Southold Town Police Department and Fire Police Squads from our neighboring Fire Departments who assisted with traffic control and detours throughout the parade. 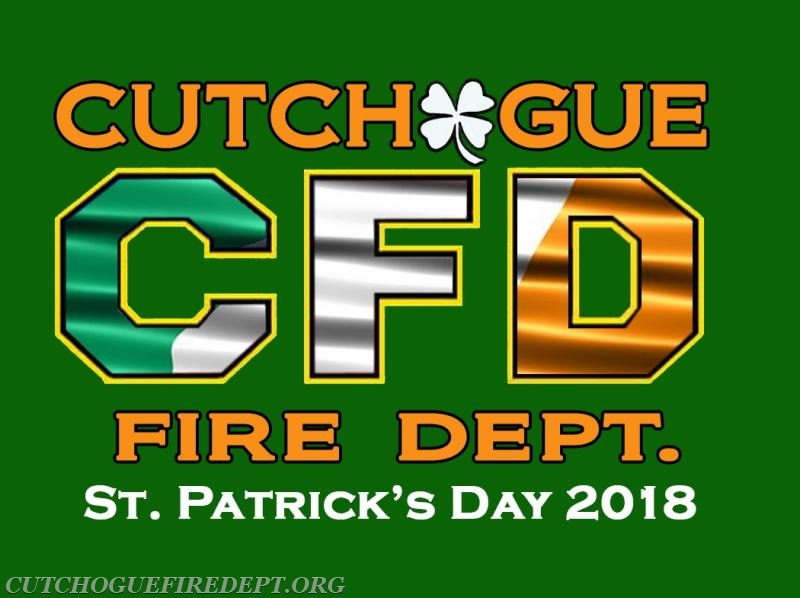 HAPPY ST. PATRICK'S DAY FROM C.F.D. 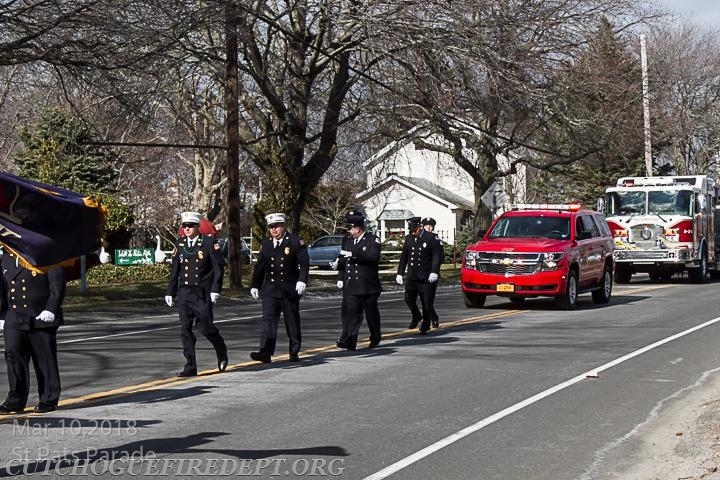 Please check back, as more photos will be added. 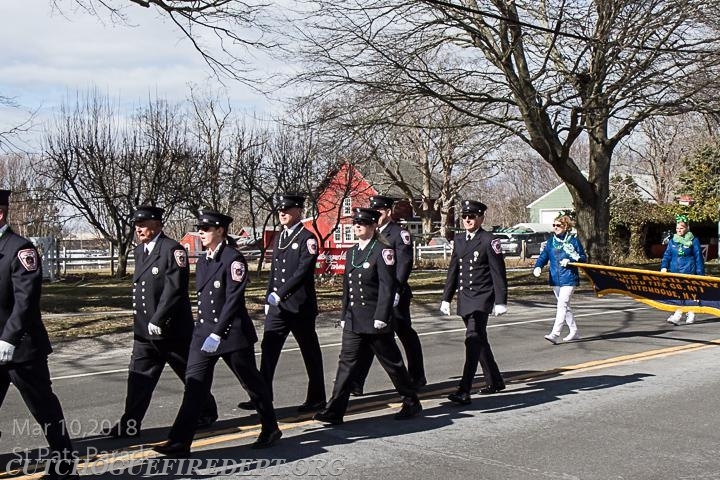 Units: CFD - Pride in Our Community!